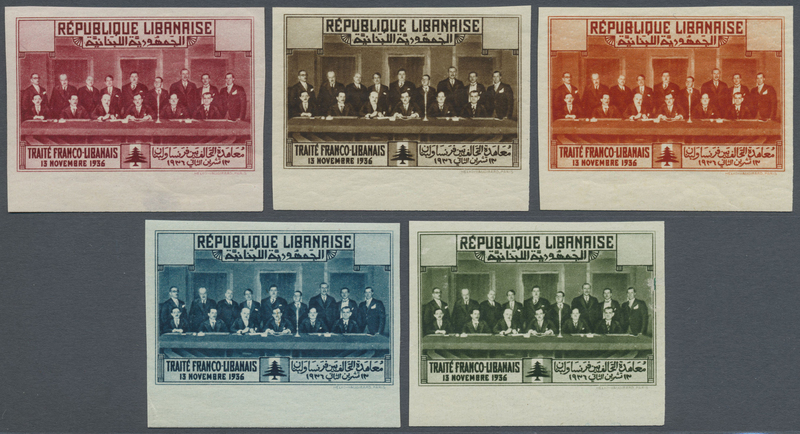 8940 postfrisch (never hinged) ** Maury 149A/D, PA56A 1936, Franco-Lebanese Treaty, not issued, complete set of five values as IMPERFORATE blocks of four, unmounted mint (0.50pi. 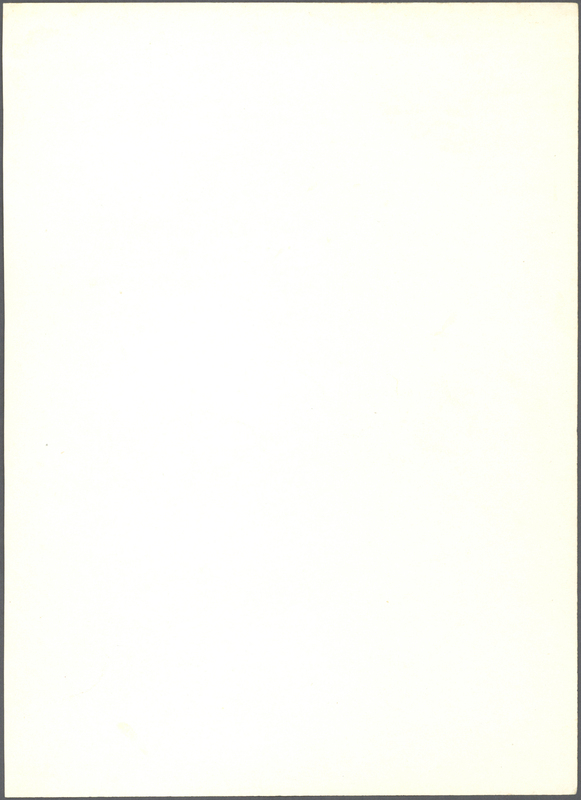 and 1pi. 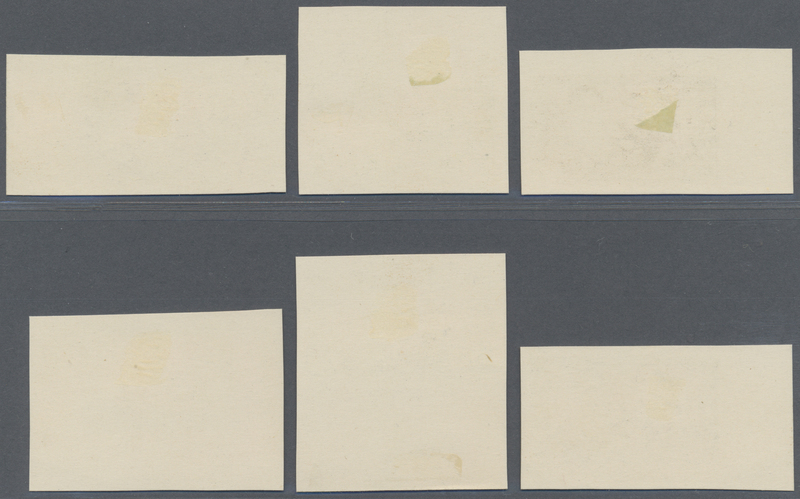 some slight gum disturbances resp. 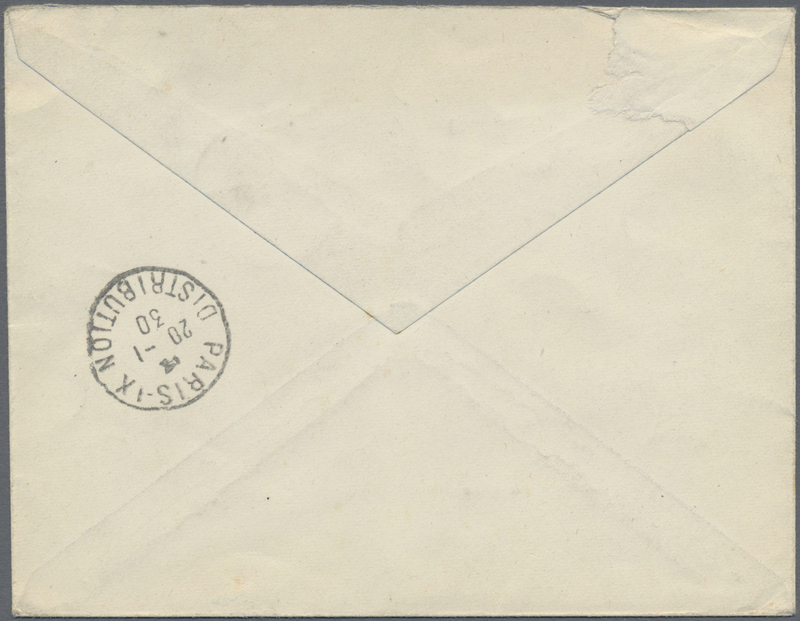 slight toning - irrelevant). 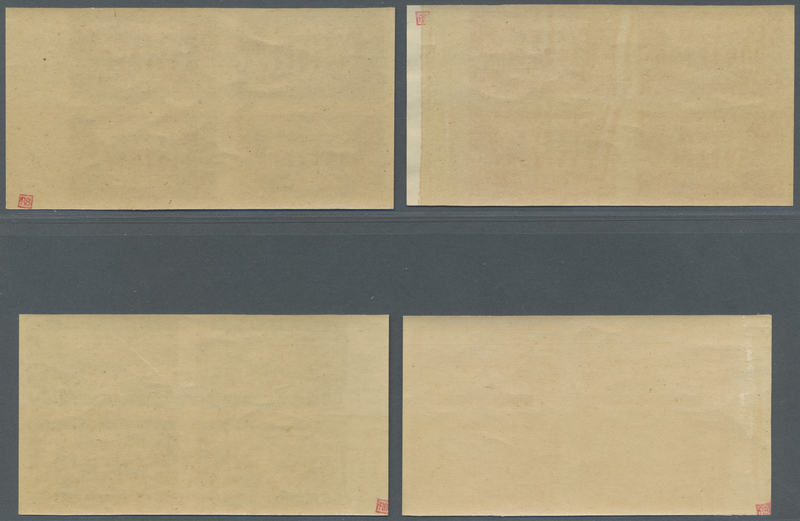 Maury 33.000,- €. 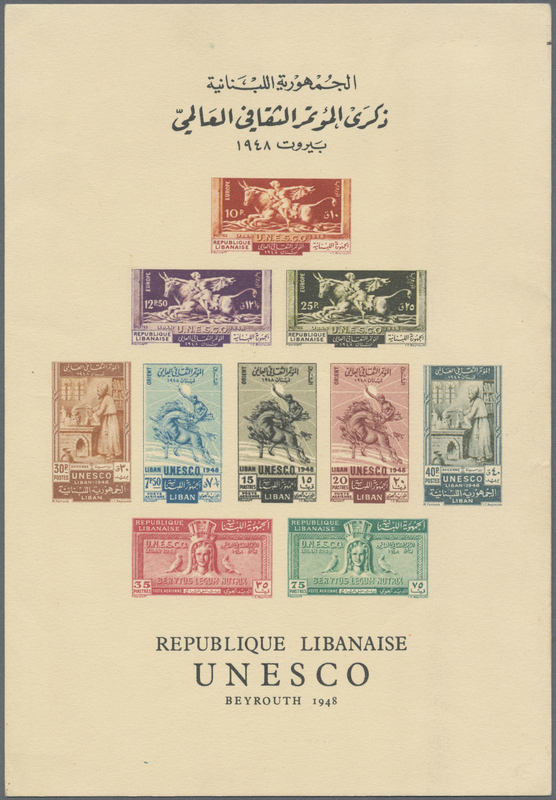 EXTREMELY RARE ISSUE, ESPECIALLY AS A UNIT - SPECTACULAR SHOWPIECE! 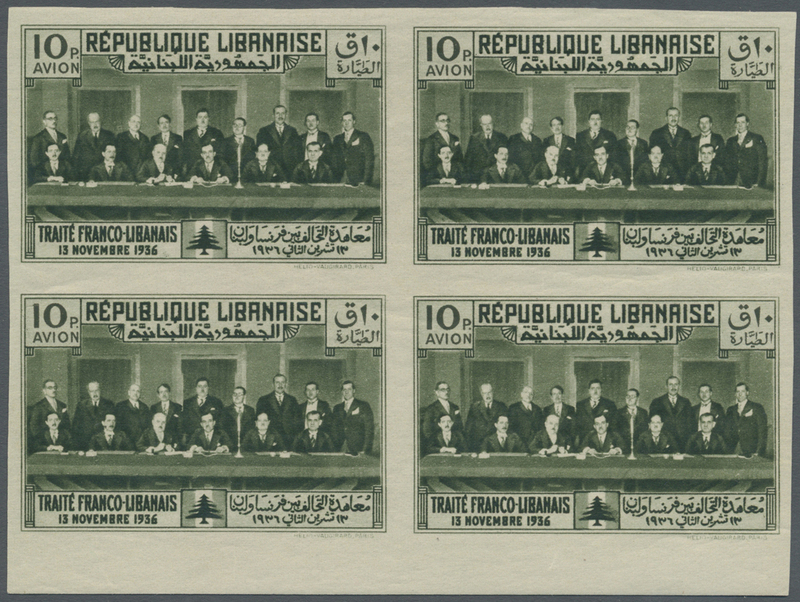 8941 postfrisch (never hinged) ** Maury 149A/D, PA56A 1936, Franco-Lebanese Treaty, not issued, complete set of five values as IMPERFORATE top marginal vertical pairs, unmounted mint (partly some slight and almost invisible adhesion marks/fingerprint), 10pi. 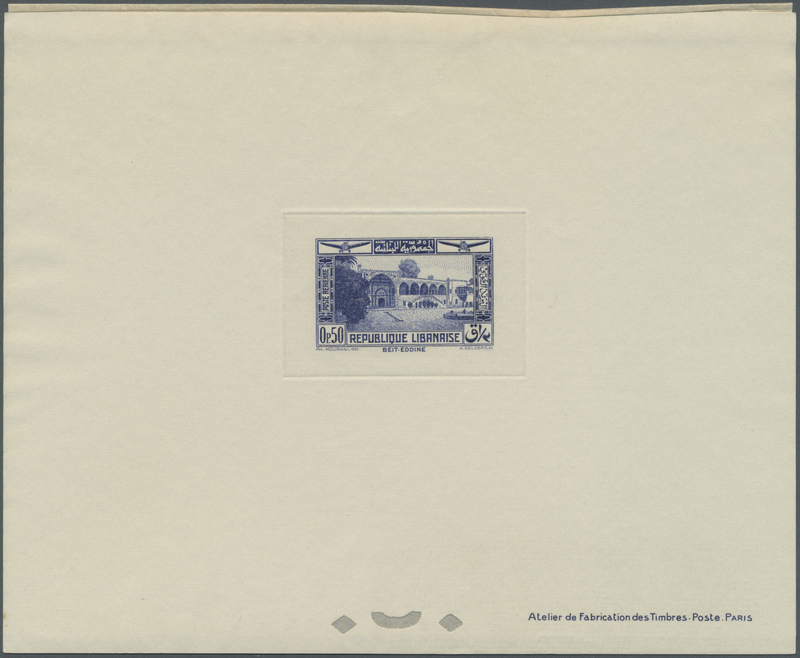 blue with clear DOUBLE IMPRESSION of value field. 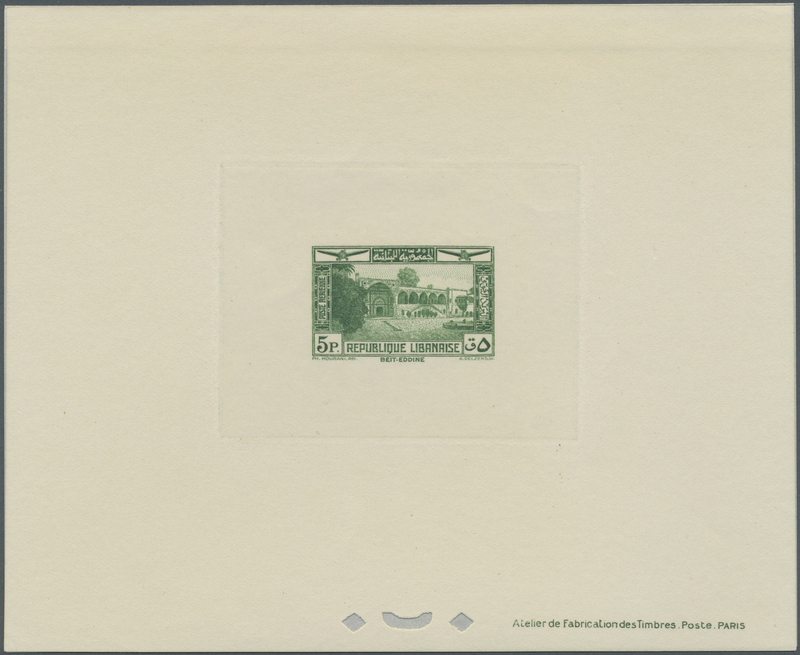 Maury 16.500,- €++. 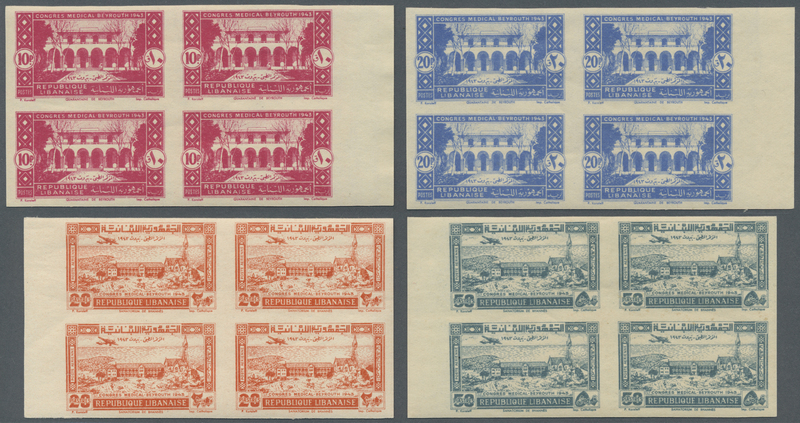 EXTREMELY RARE ISSUE, ESPECIALLY AS PAIRS - A SPECTACULAR SHOWPIECE! 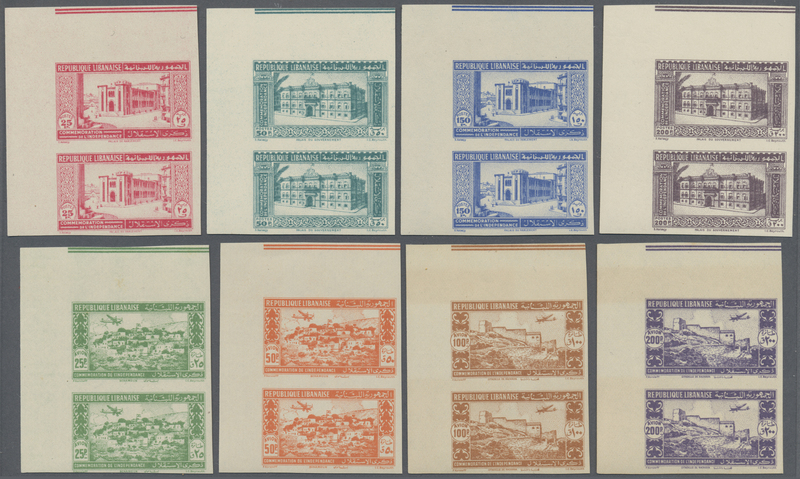 8942 ungebraucht (hinged) * postfrisch (never hinged) ** Maury 149A/D, PA56A 1936, Franco-Lebanese Treaty, not issued, complete set of five values imperforate and with BLANK VALUE FIELD, bottom marginal set, mint o.g., some faults. 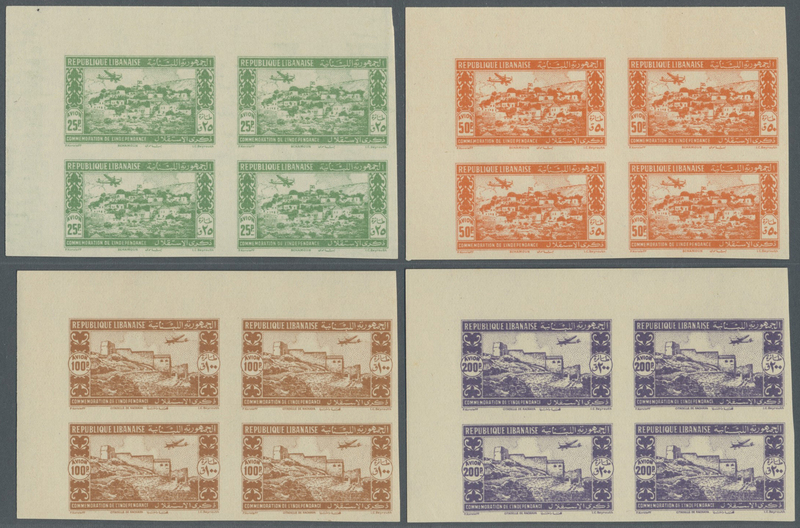 8943 postfrisch (never hinged) ** ungebraucht (hinged) * Maury 149A/D, PA56A 1936, Franco-Lebanese Treaty, not issued, complete set of five values, mint o.g. 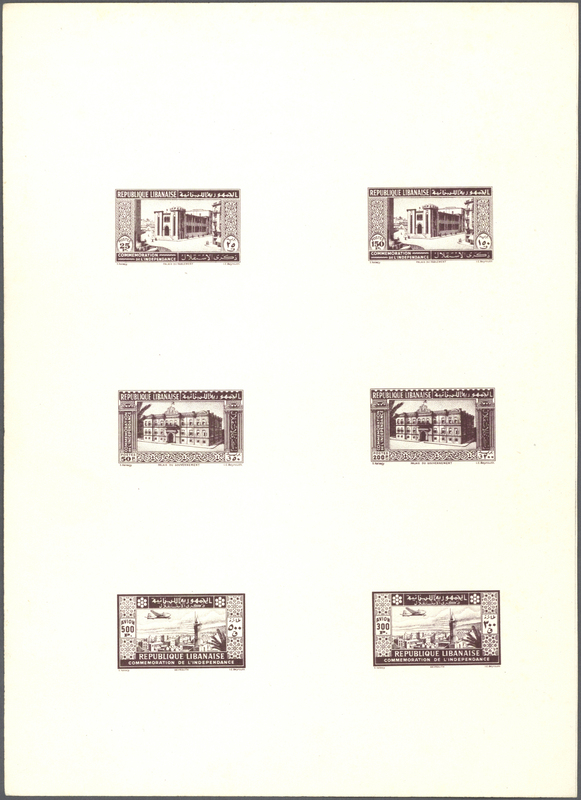 (0.50pi., 1pi. 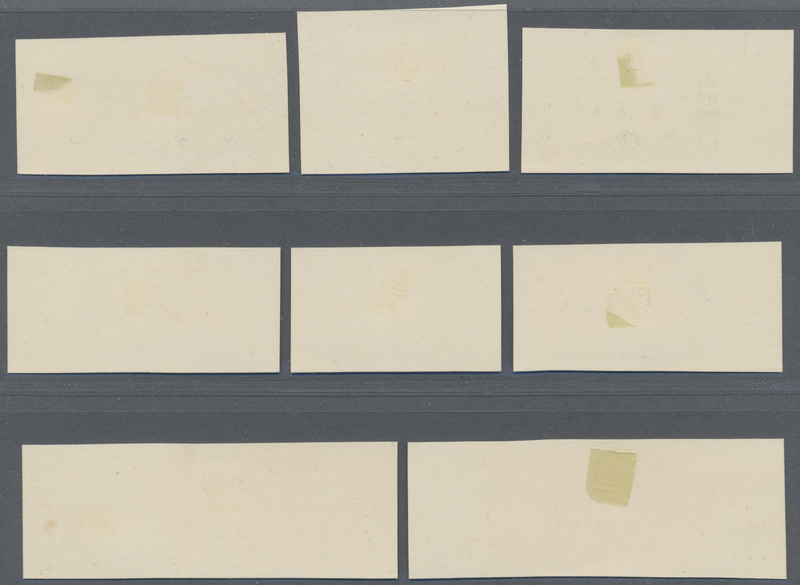 and 4pi. 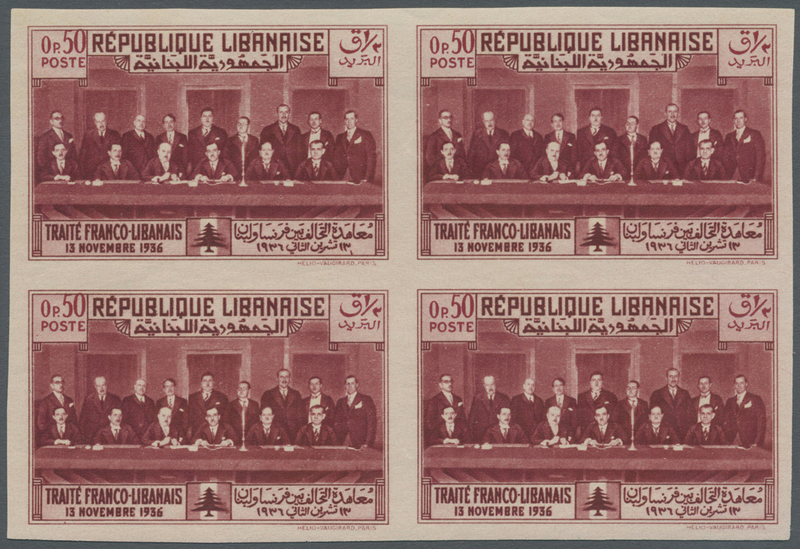 unmounted mint). 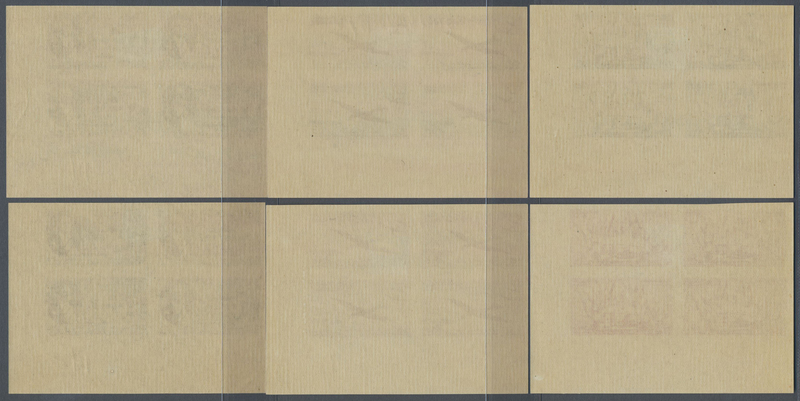 Maury 1.765,- €. 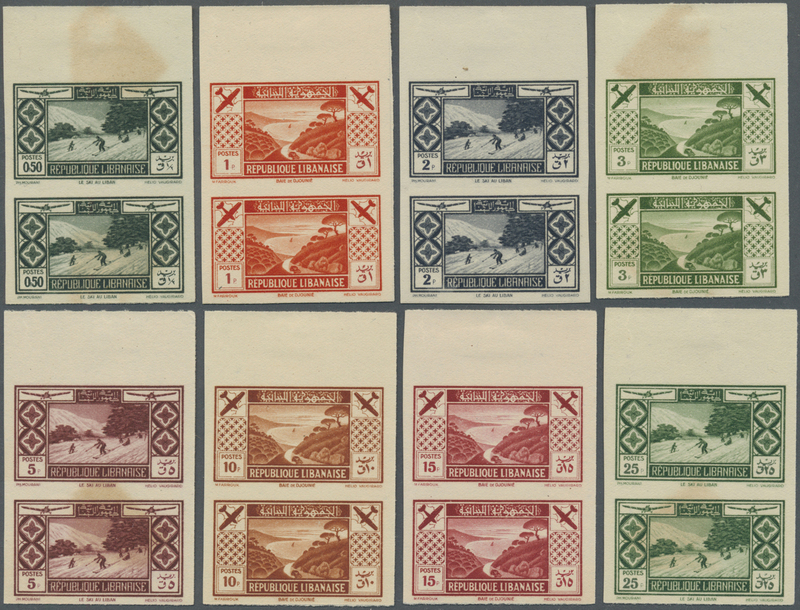 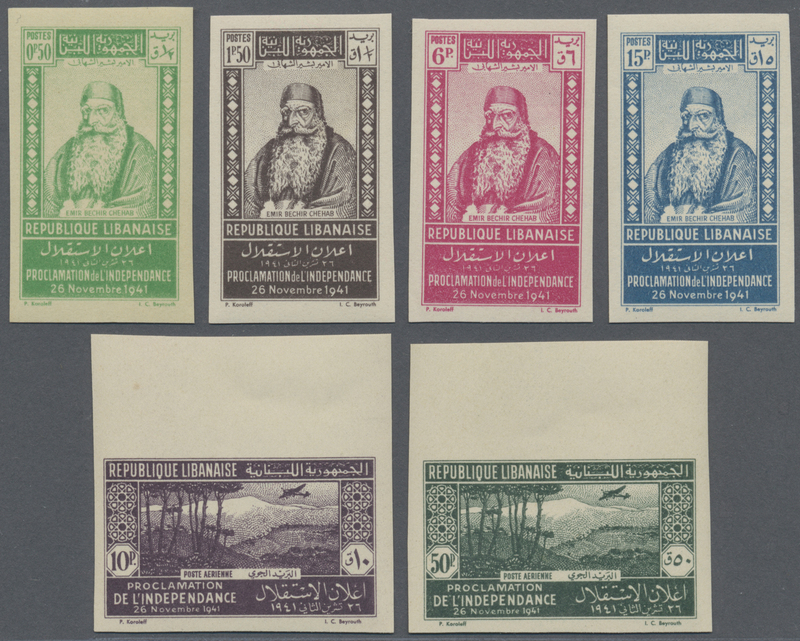 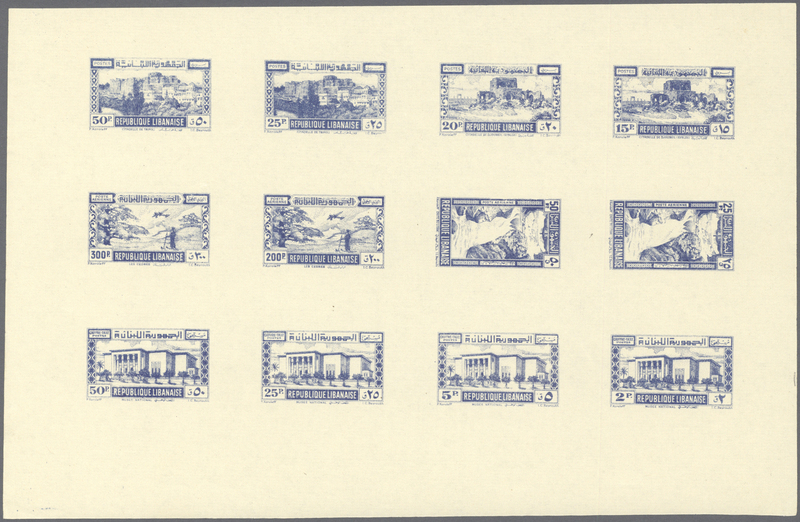 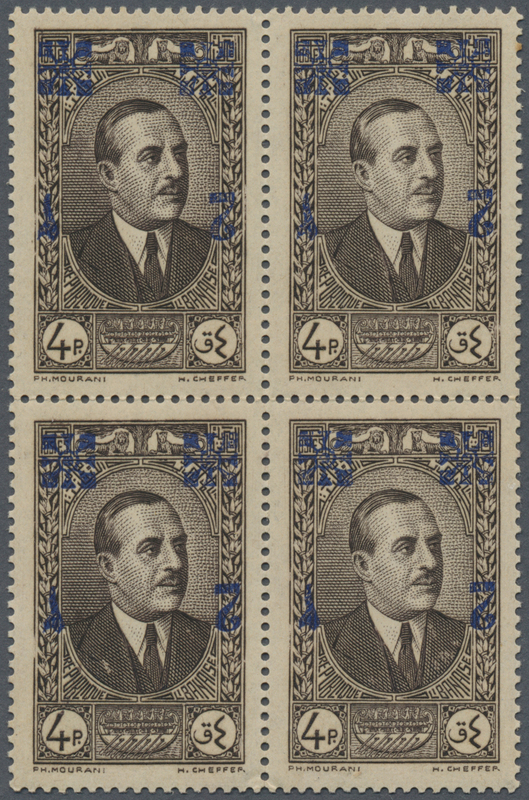 8944 postfrisch (never hinged) ** 196/203 U (2) 1936, Tourism, complete set of eight values as IMPERFORATE top marginal vertical pairs, unmounted mint and hinged in margin only, four pairs with toning. 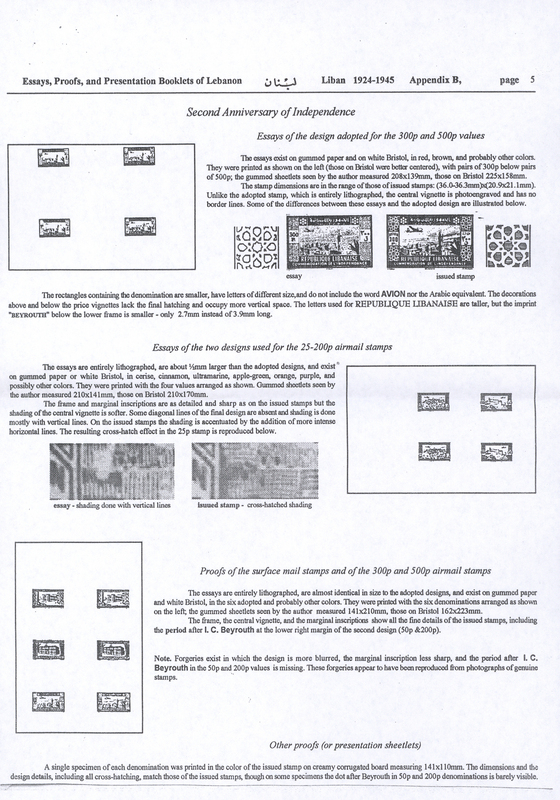 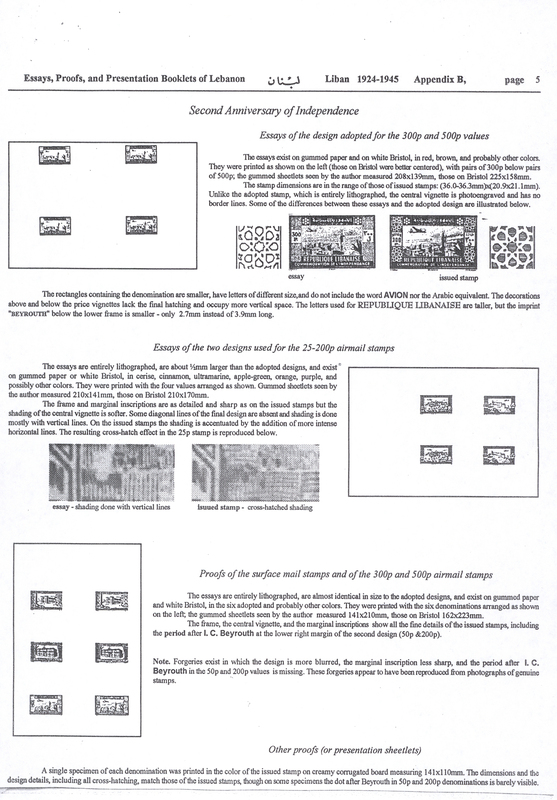 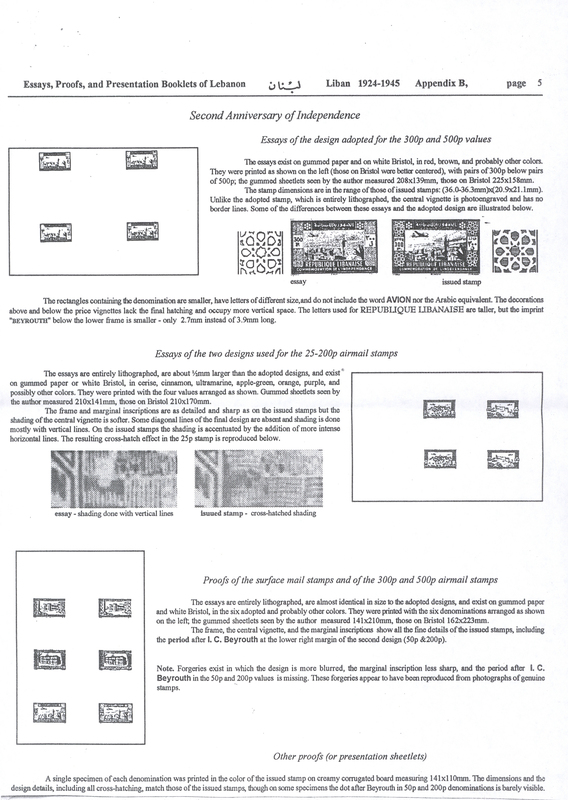 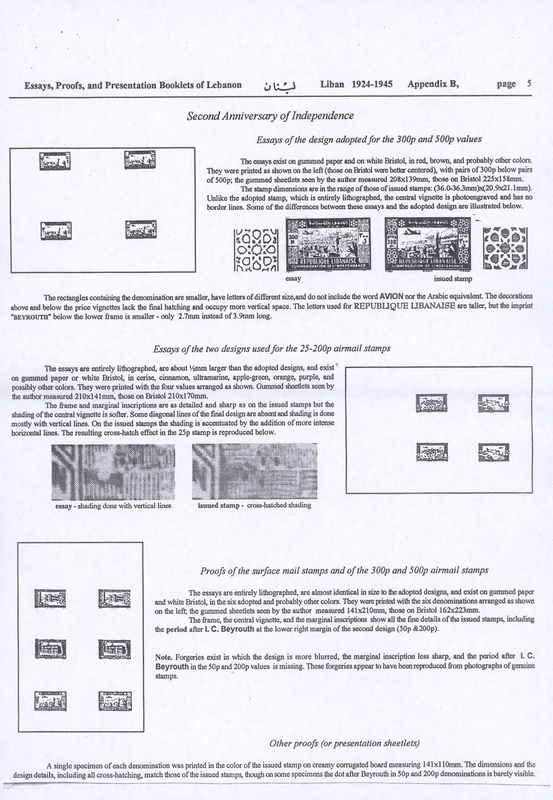 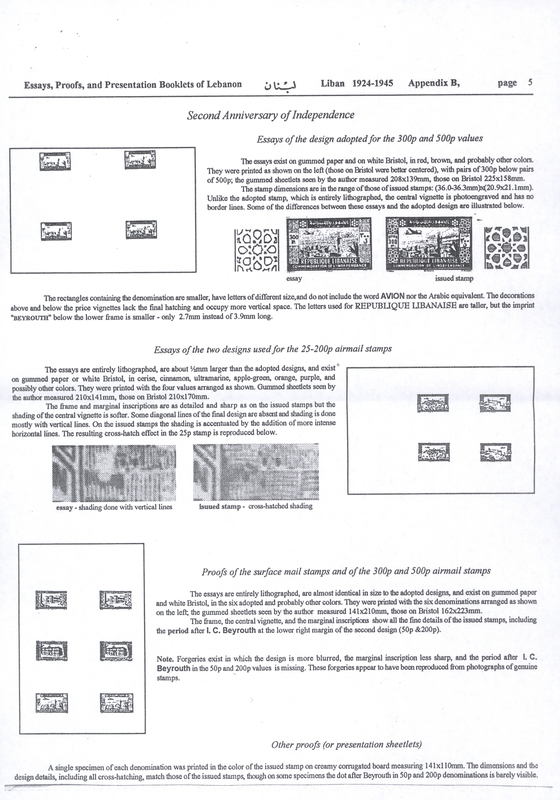 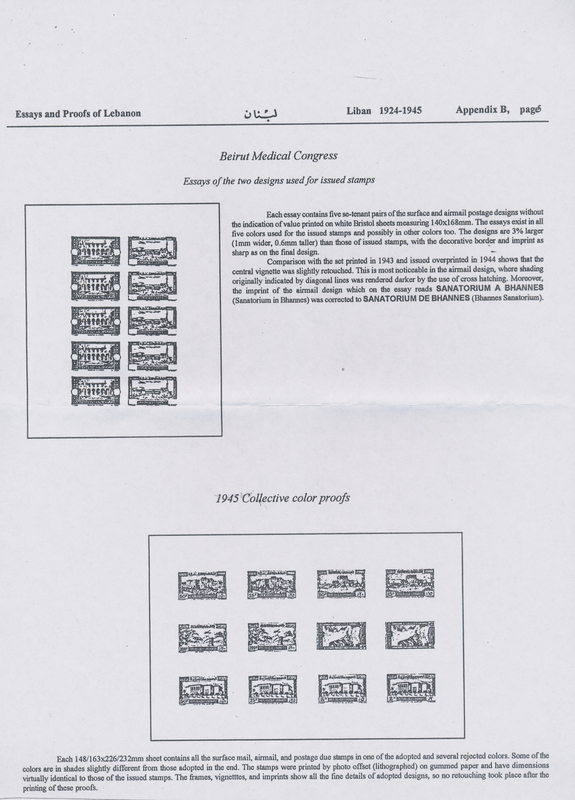 Only 150 imperforate sets were issued. Maury PA49/56, 2.860,- €. 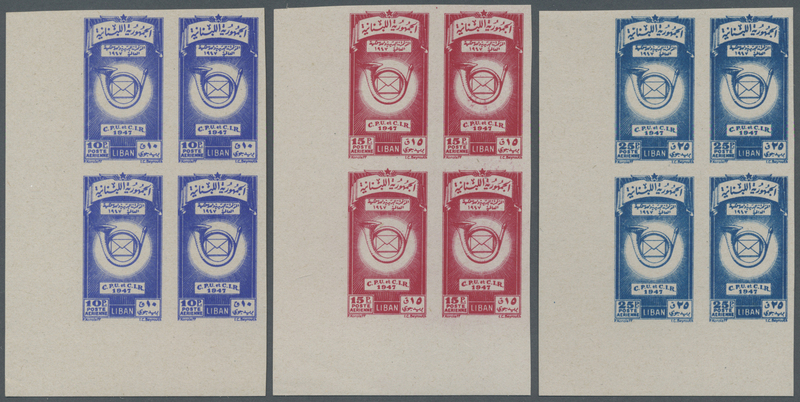 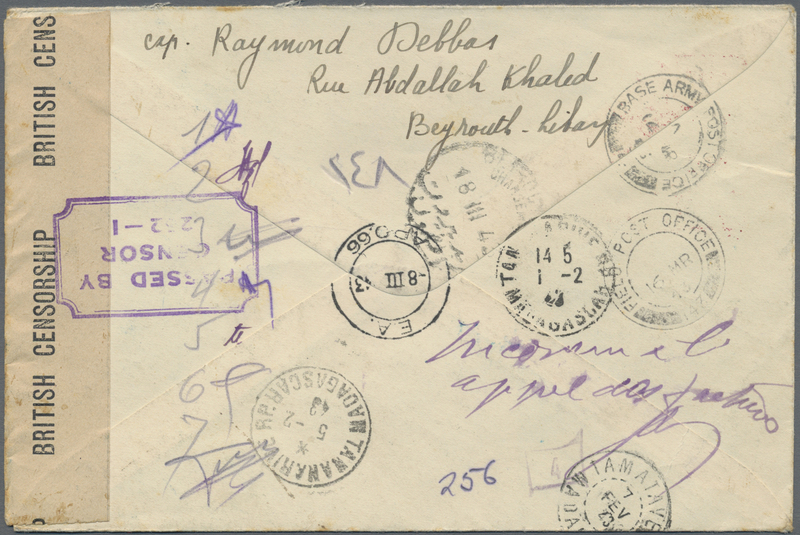 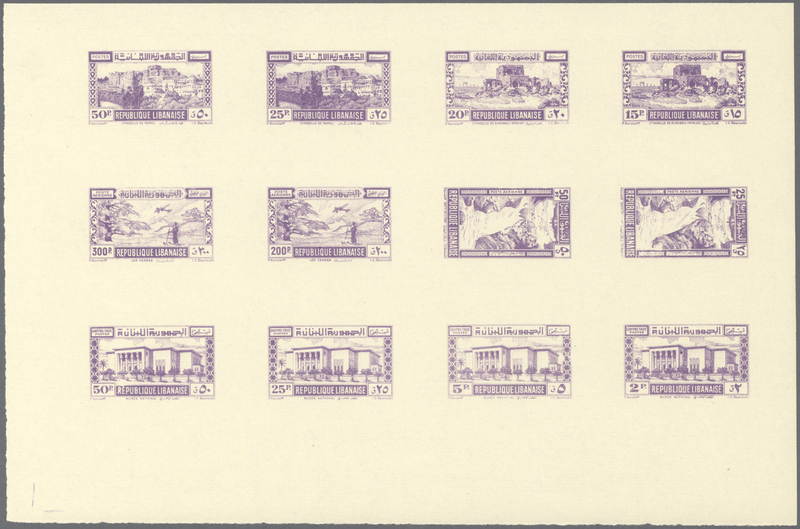 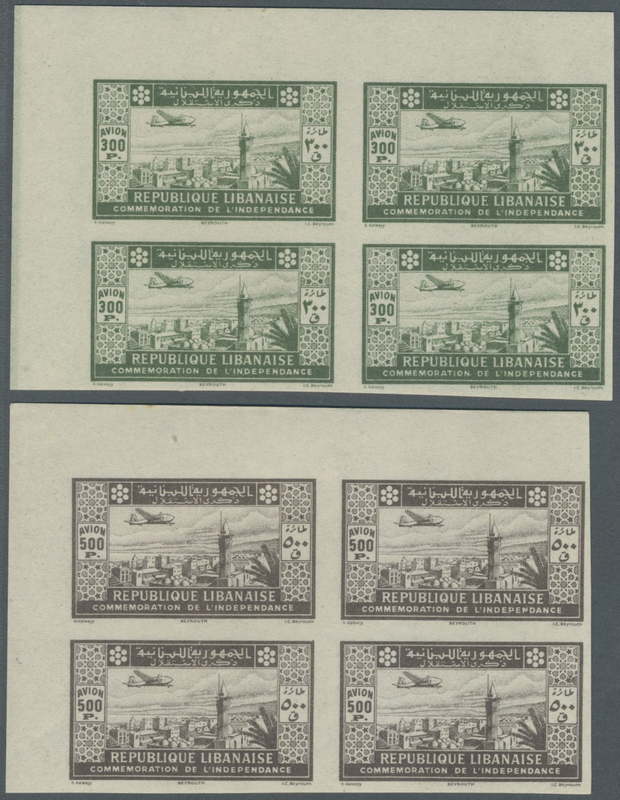 8948 ungebraucht ohne Gummi (unused without gum) (*) 228/37 1937/1940, Airmails "Beit-Eddine" and "Baalbek", 0.50pi. 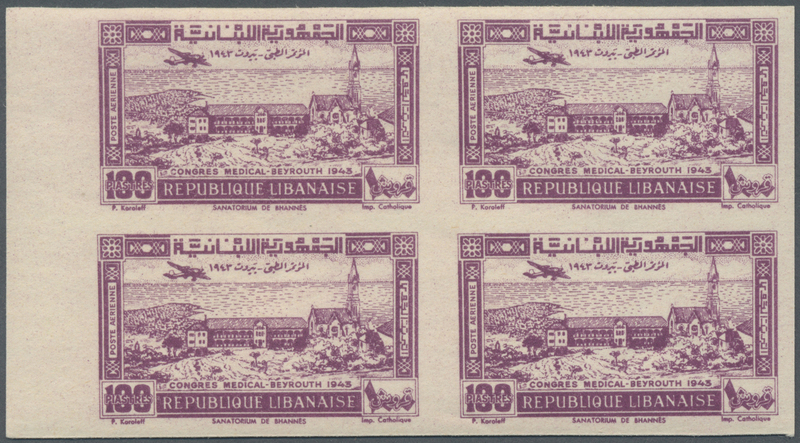 to 100pi., complete set of ten values as epreuve de luxe. 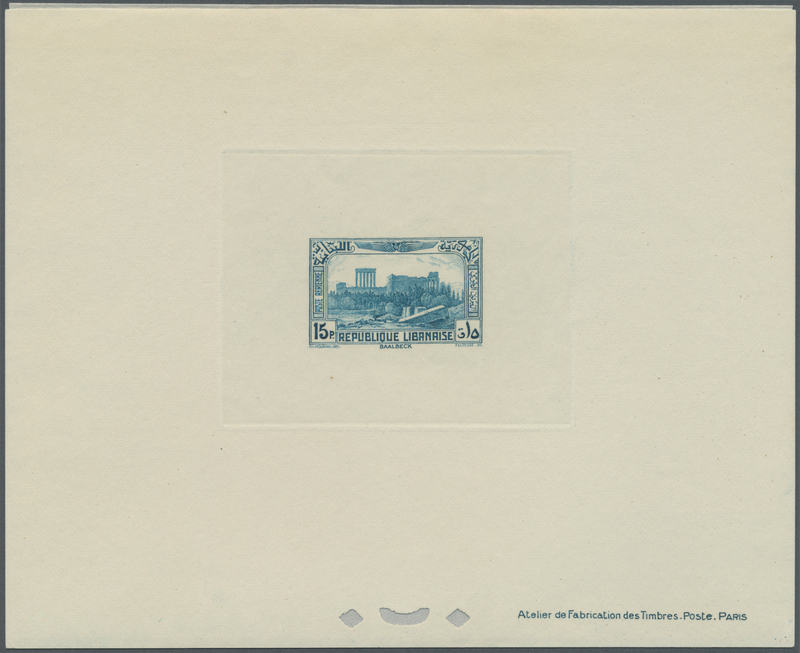 Maury PA57/58, PA72/79, 1.680,- €. 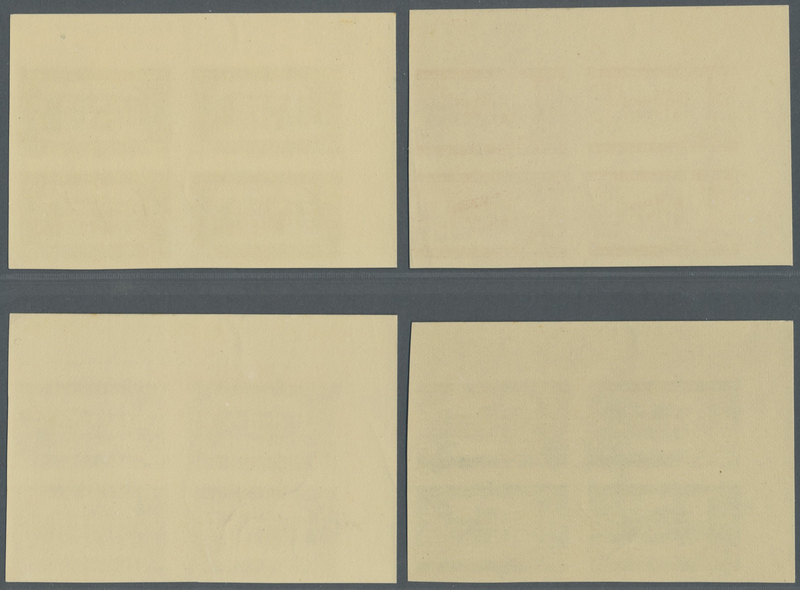 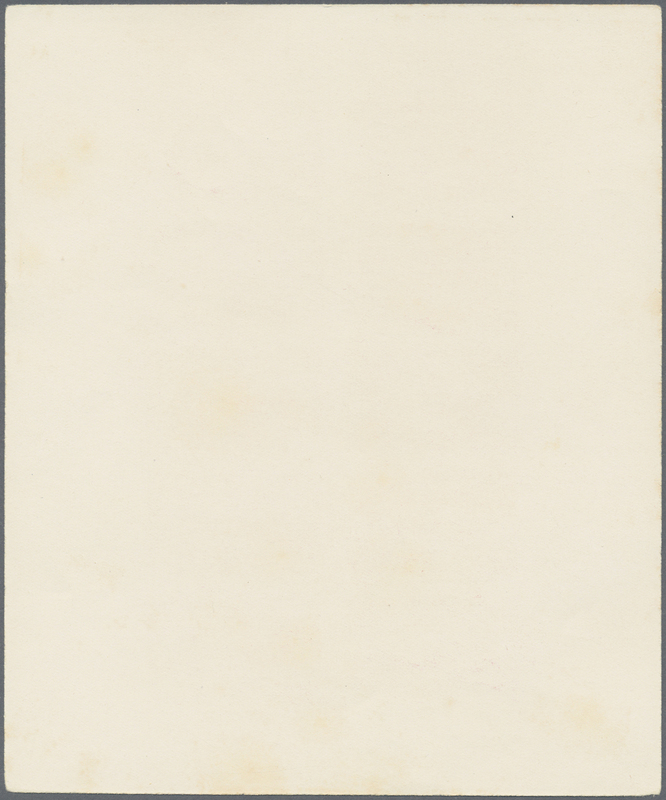 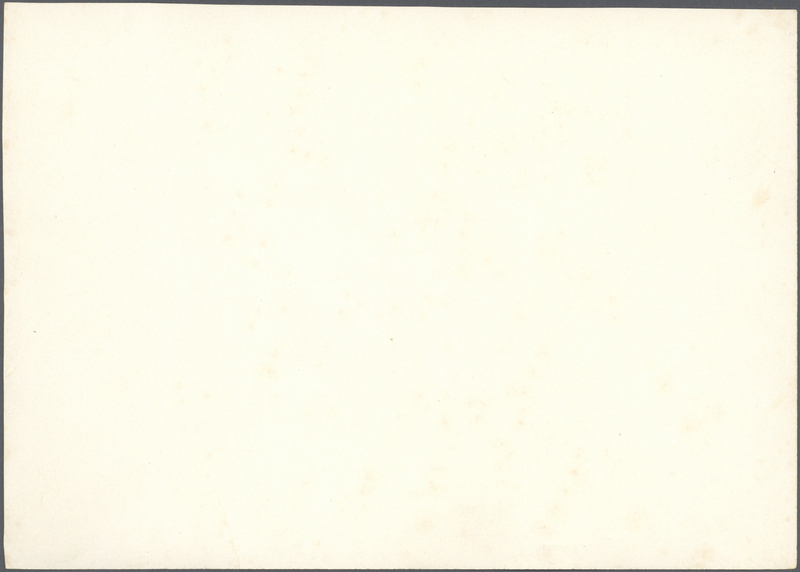 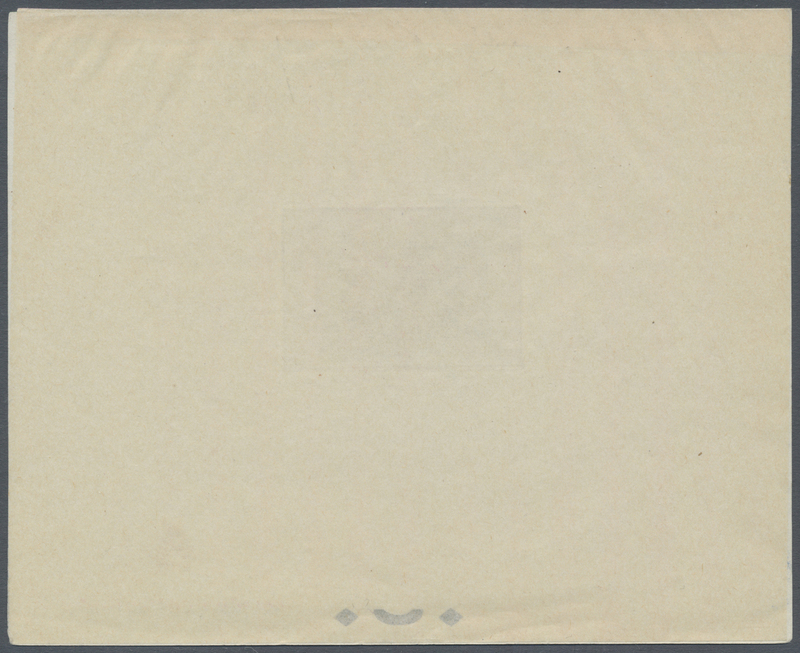 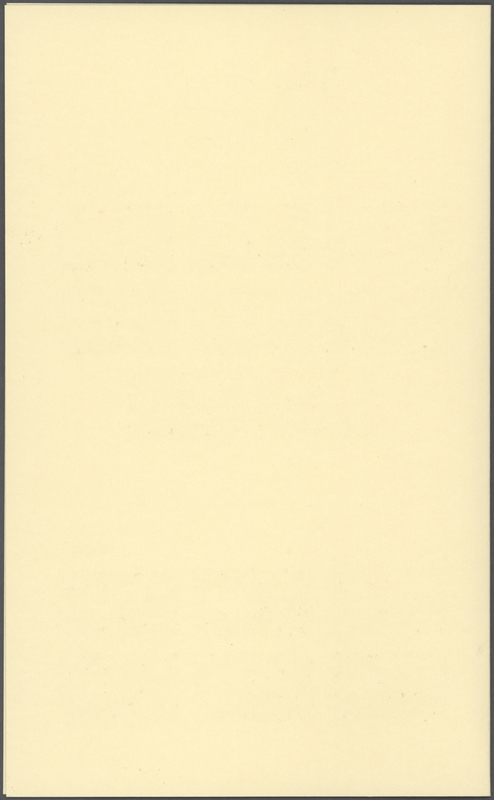 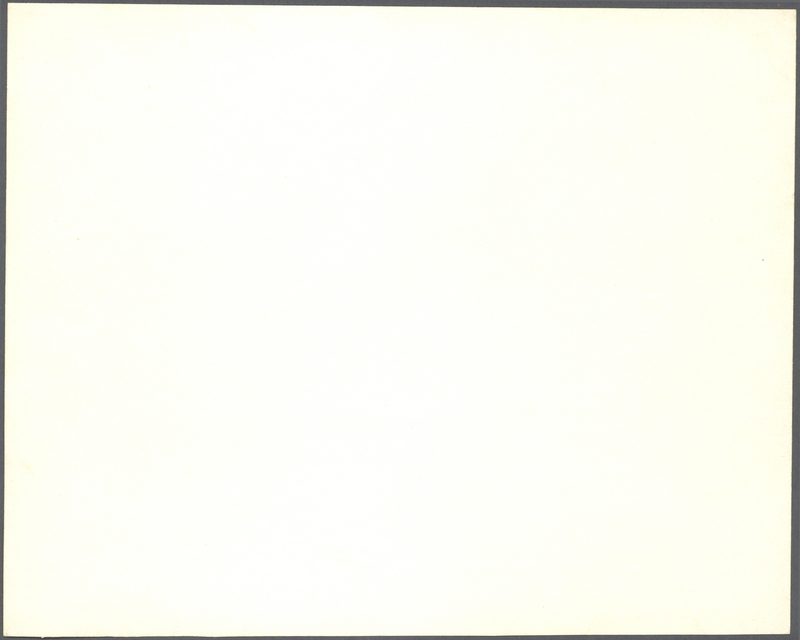 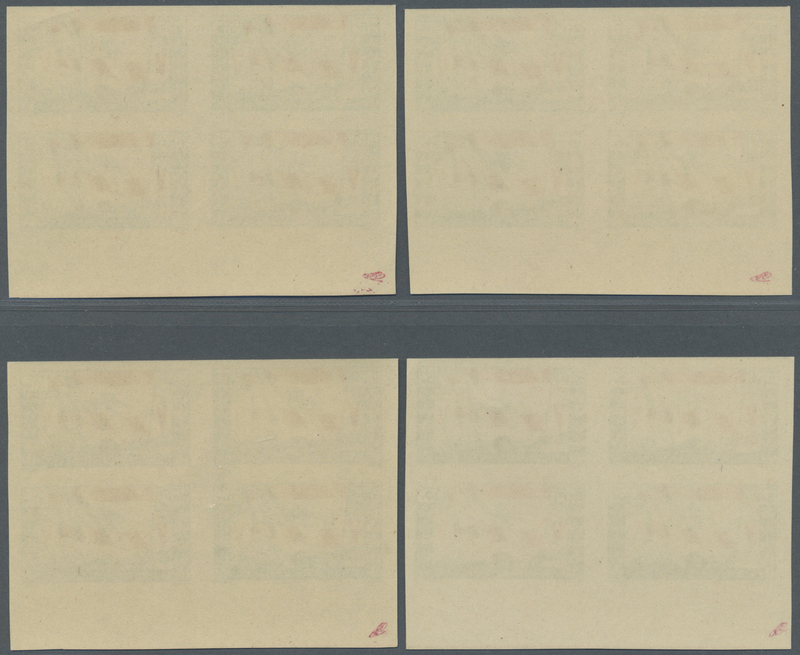 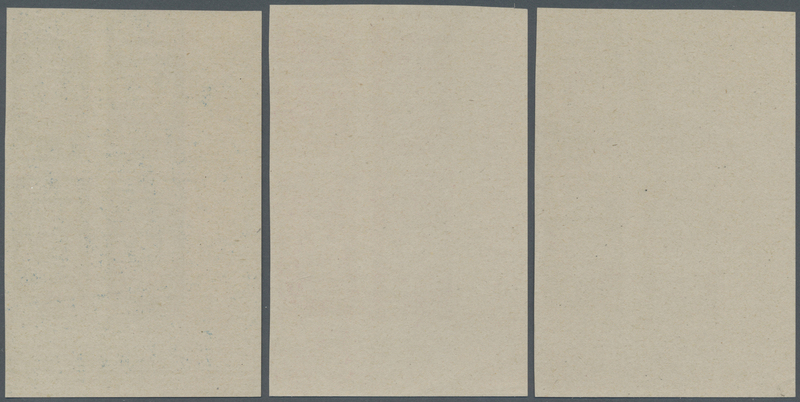 8949 postfrisch (never hinged) ** Bl. 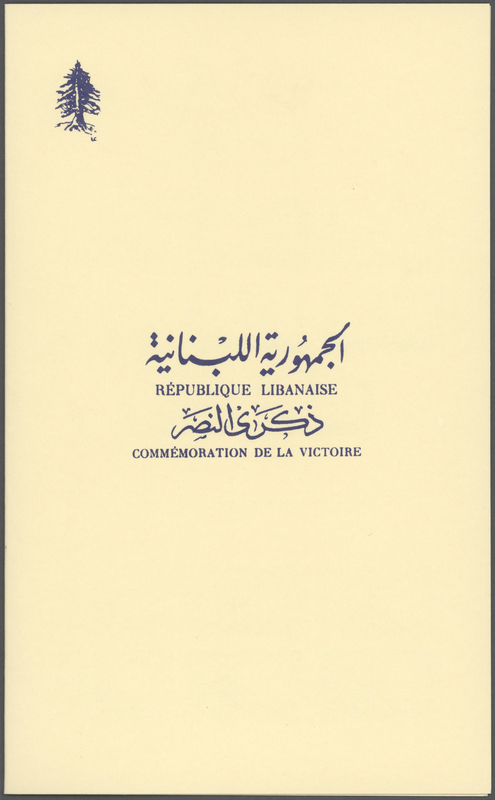 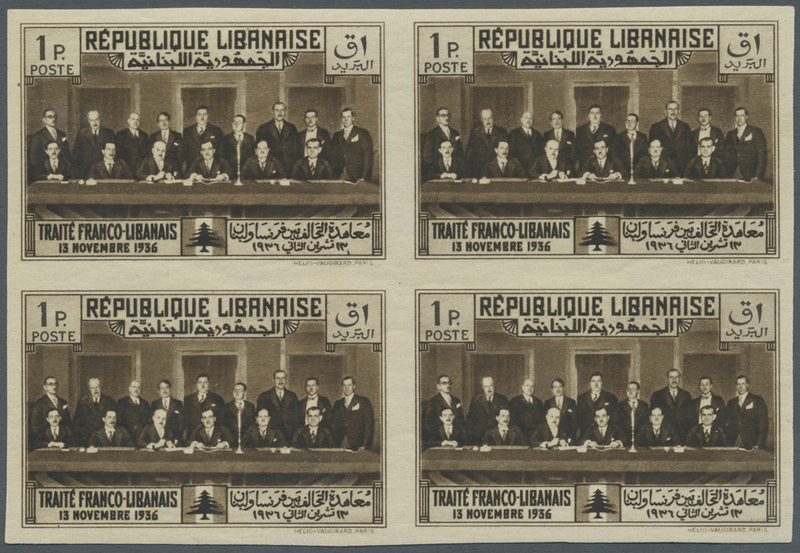 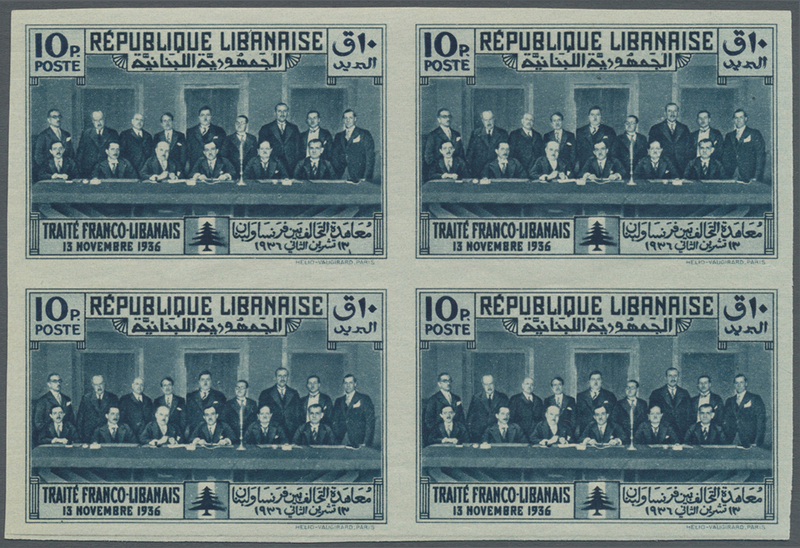 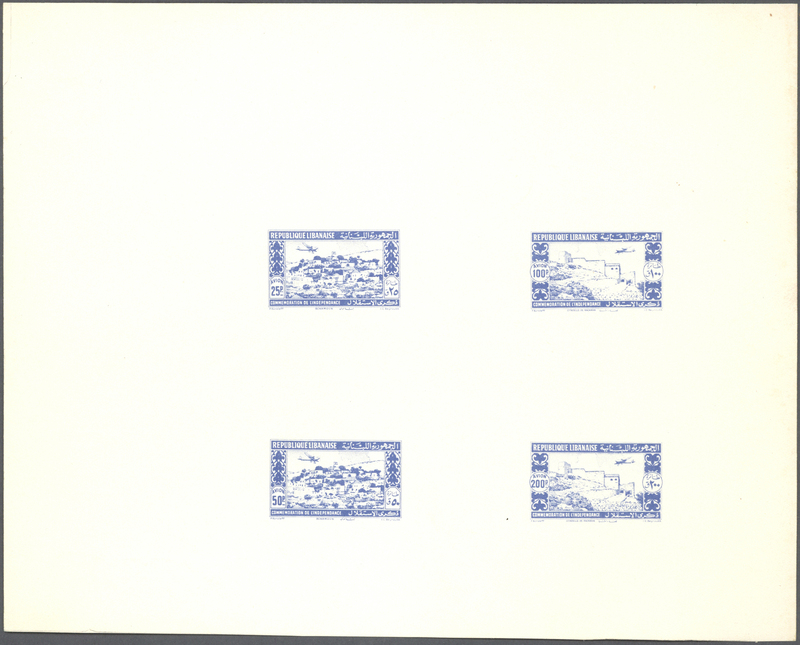 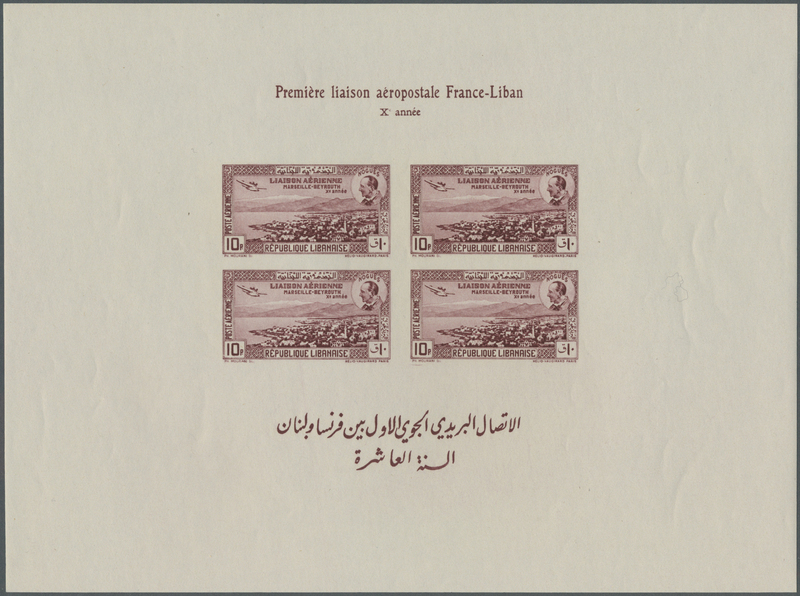 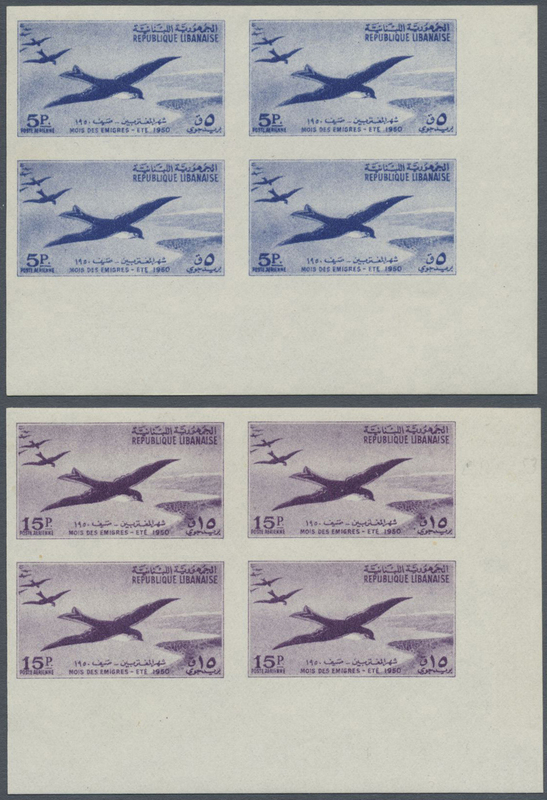 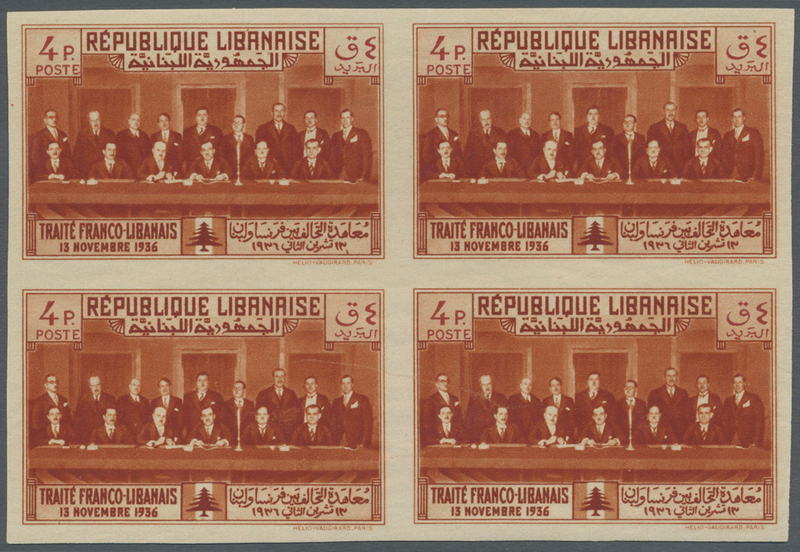 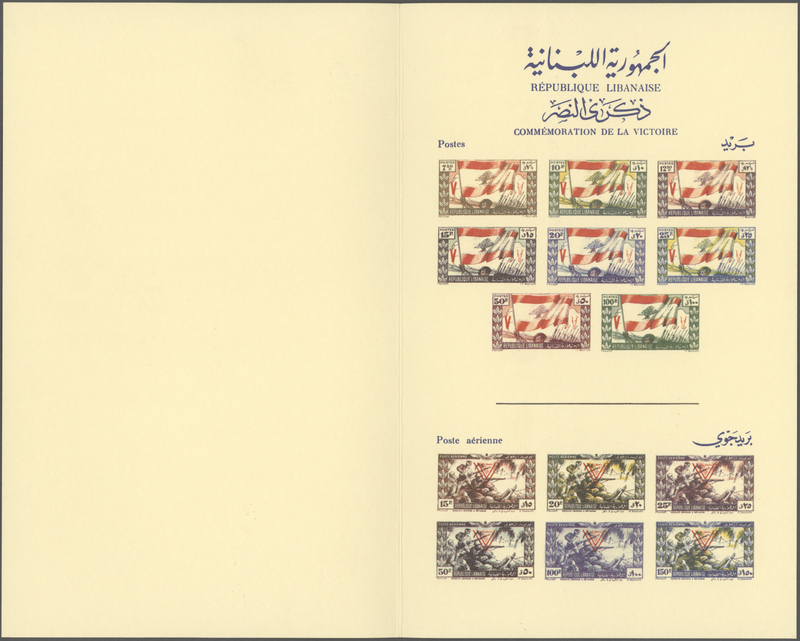 1 B 1938, 10th Anniversary First Flight Marseille-Beirut, IMPERFORATE souvenir sheet, unmounted mint. 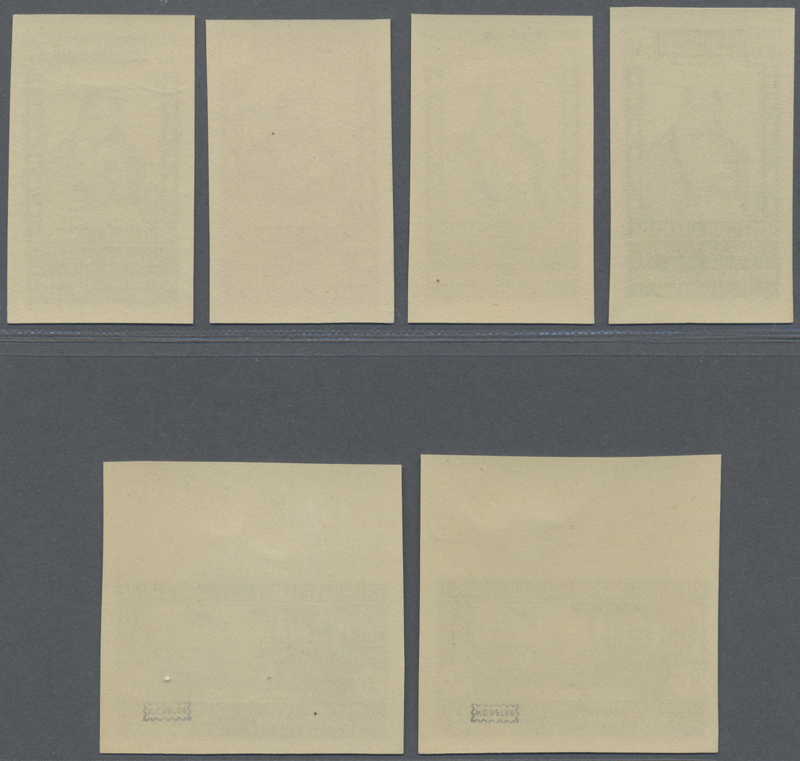 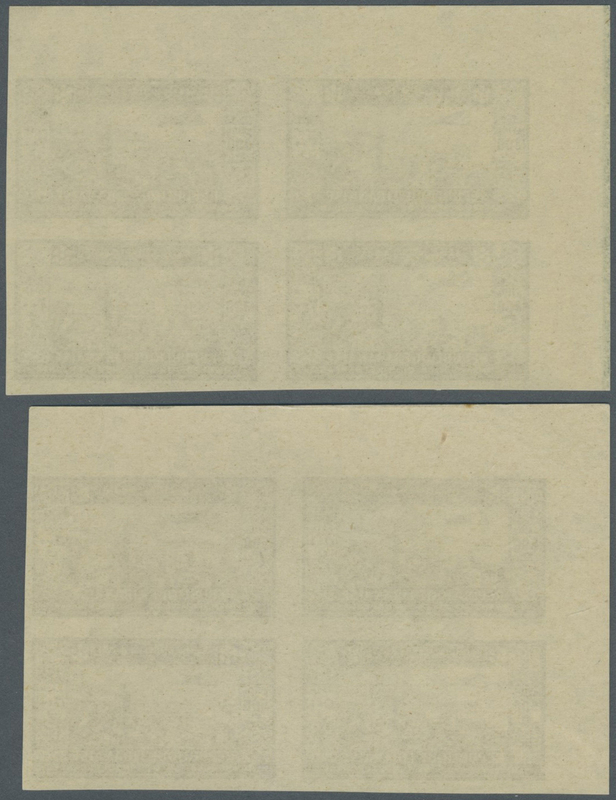 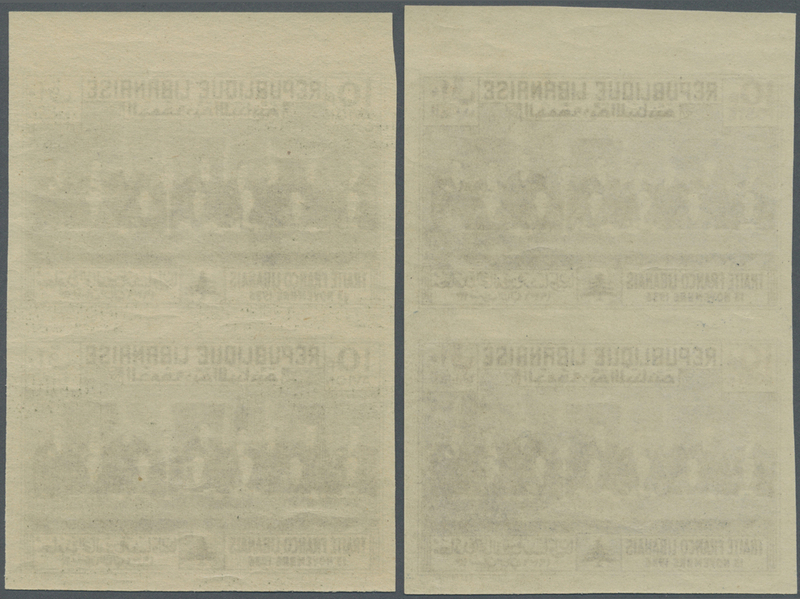 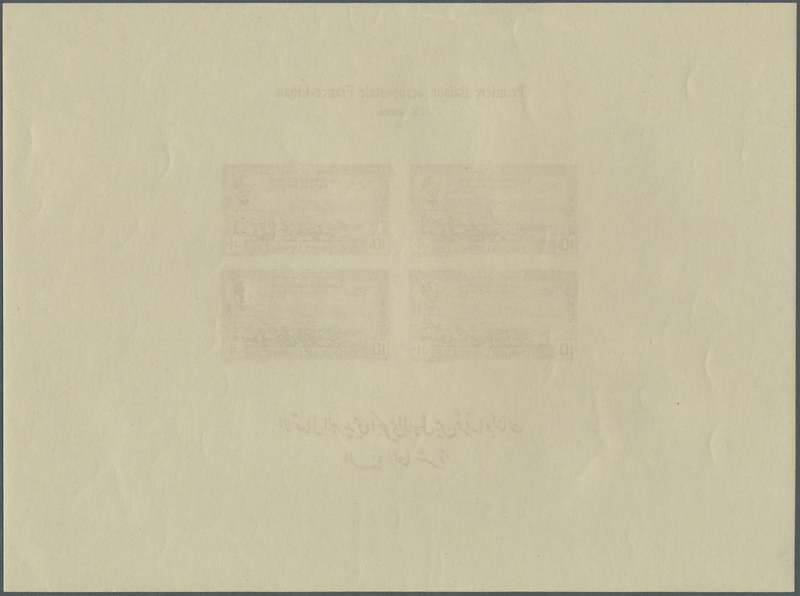 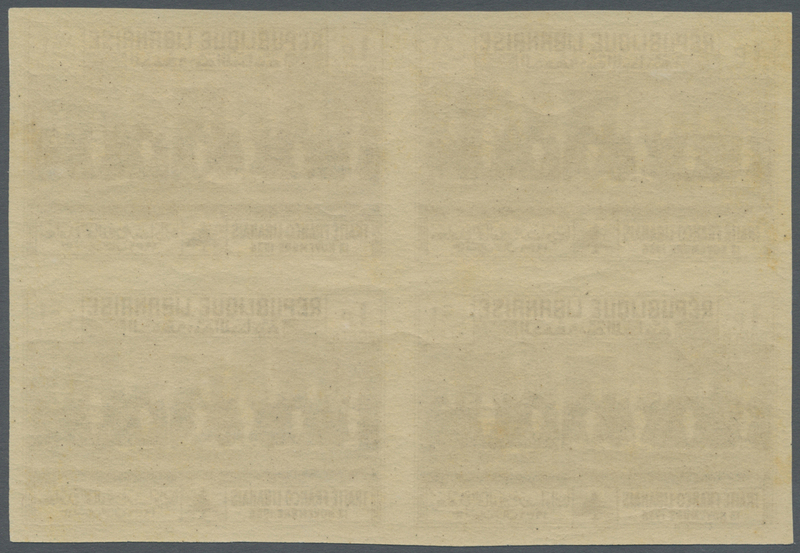 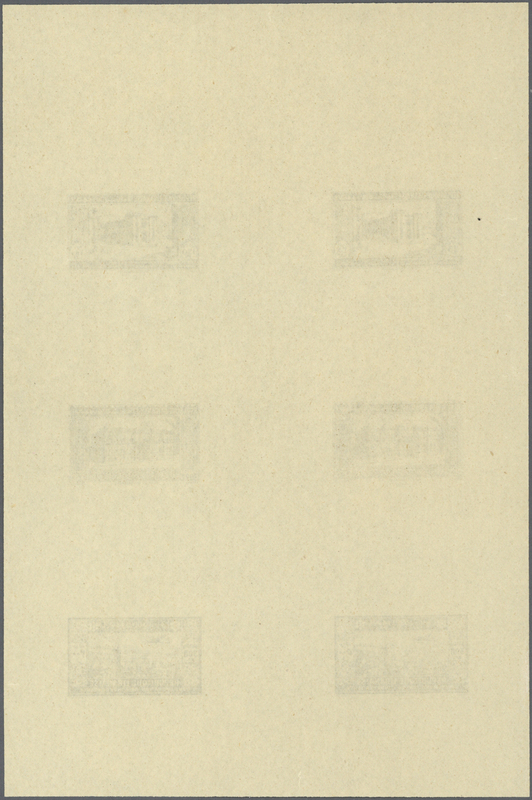 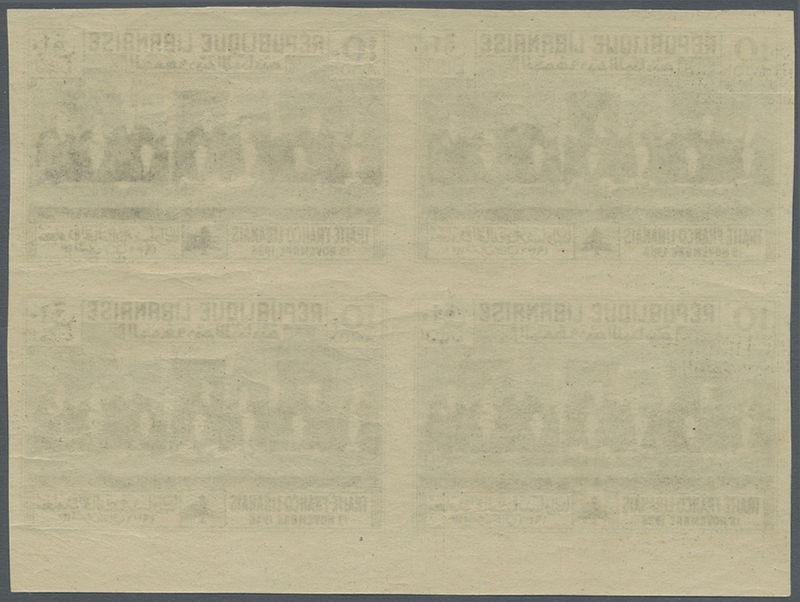 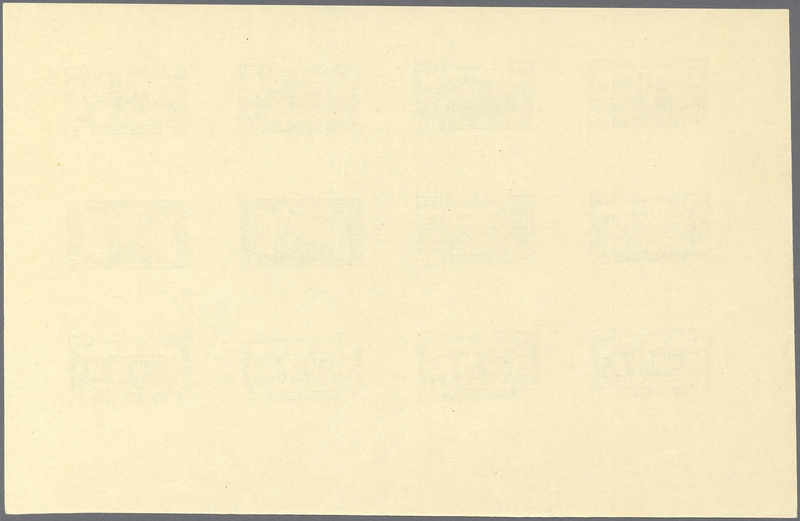 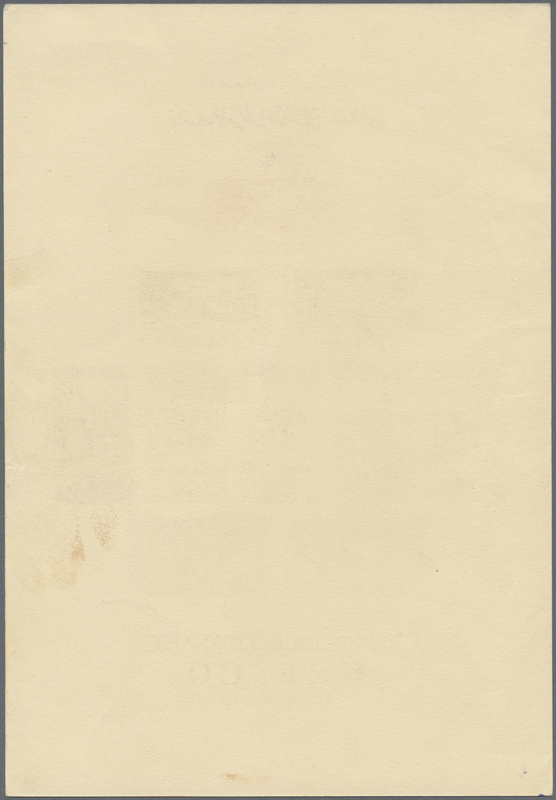 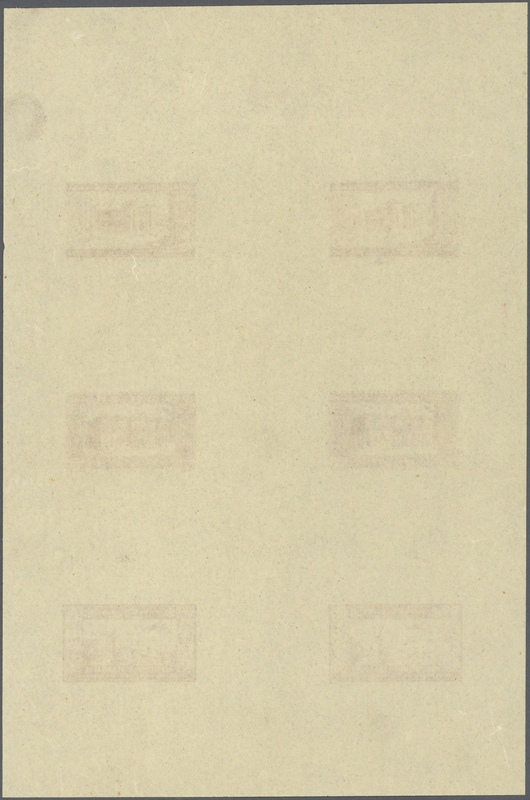 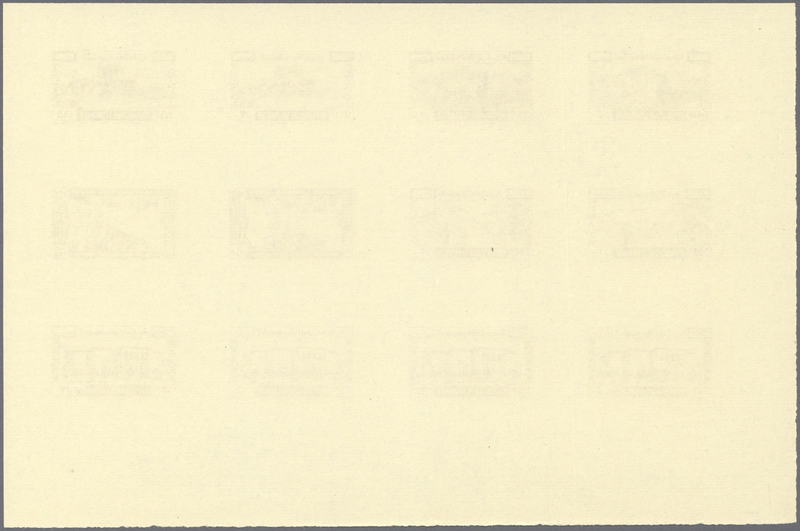 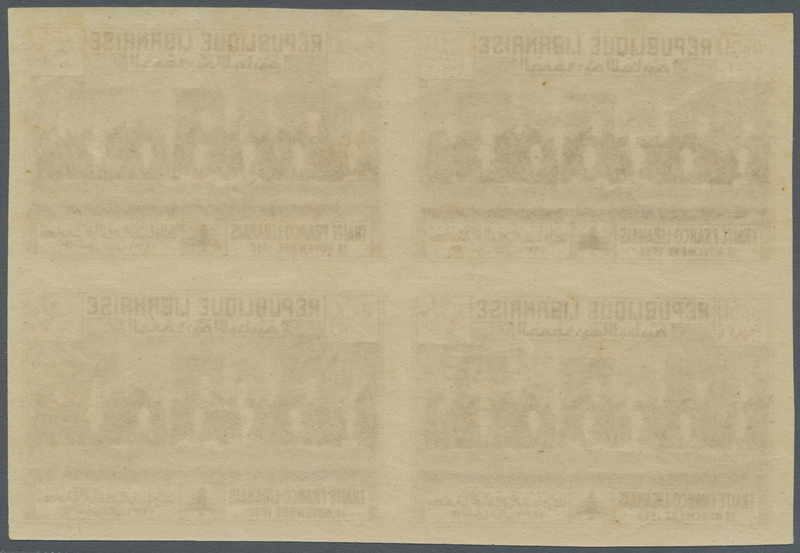 Only 120 sheets were issued imperforate. 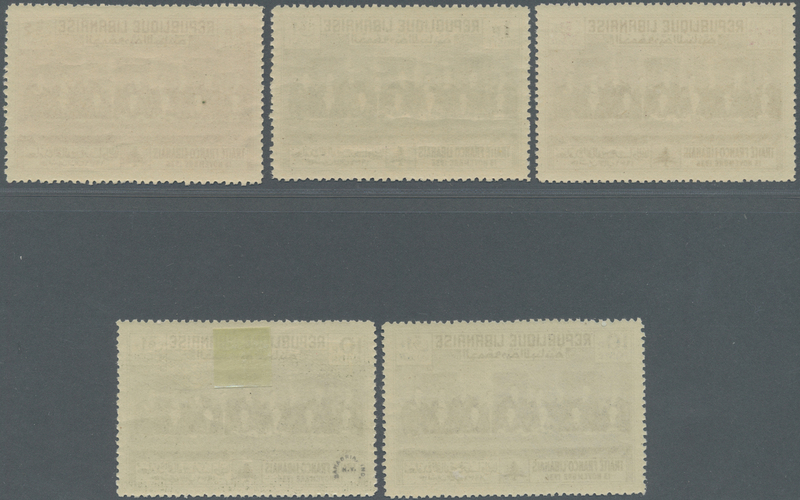 Maury BF1 nd, 2.750,- €. 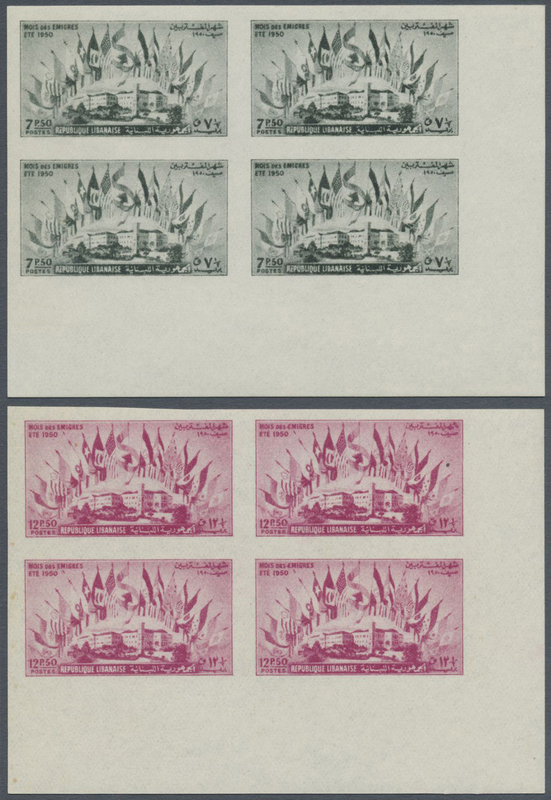 8950 postfrisch (never hinged) ** Bl. 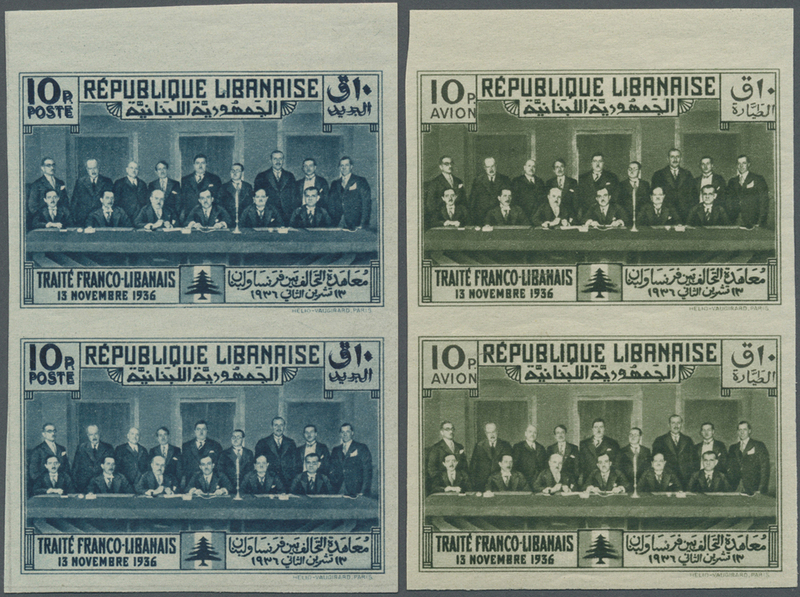 1 B 1938, 10th Anniversary First Flight Marseille-Beirut, IMPERFORATE souvenir sheet, unmounted mint. 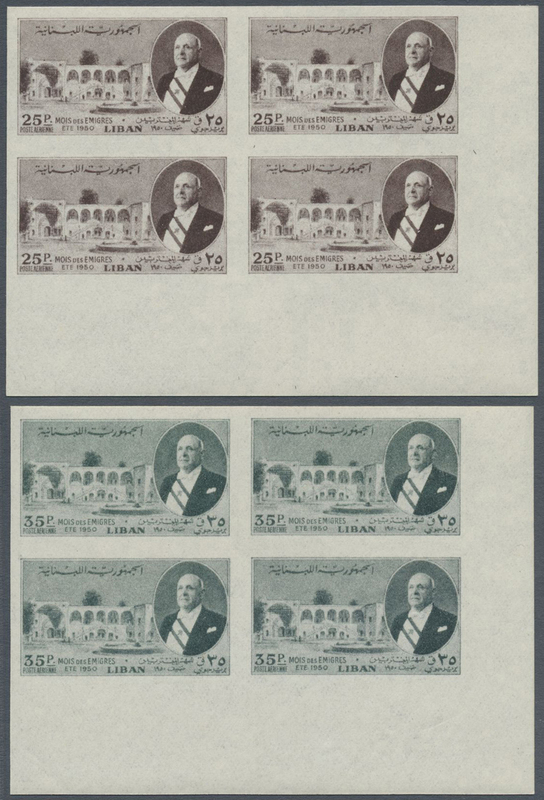 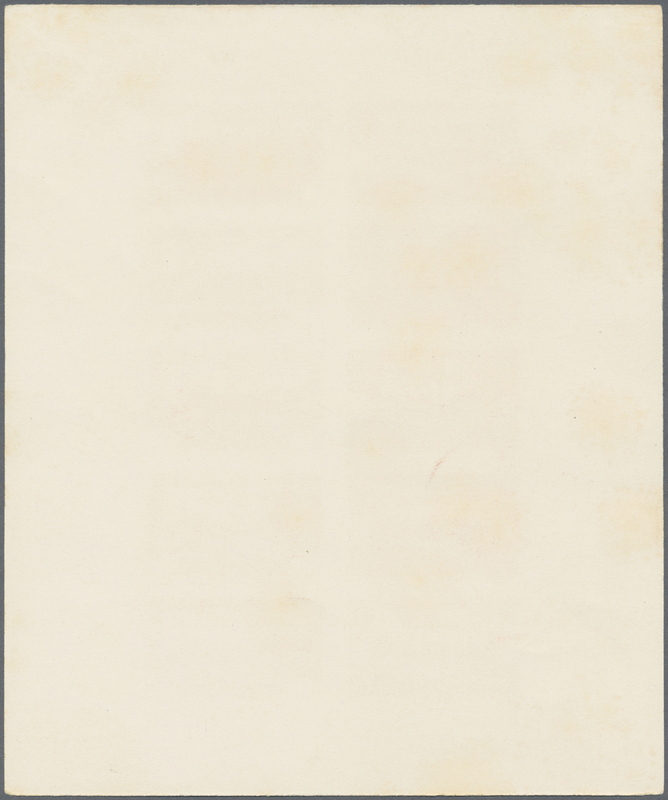 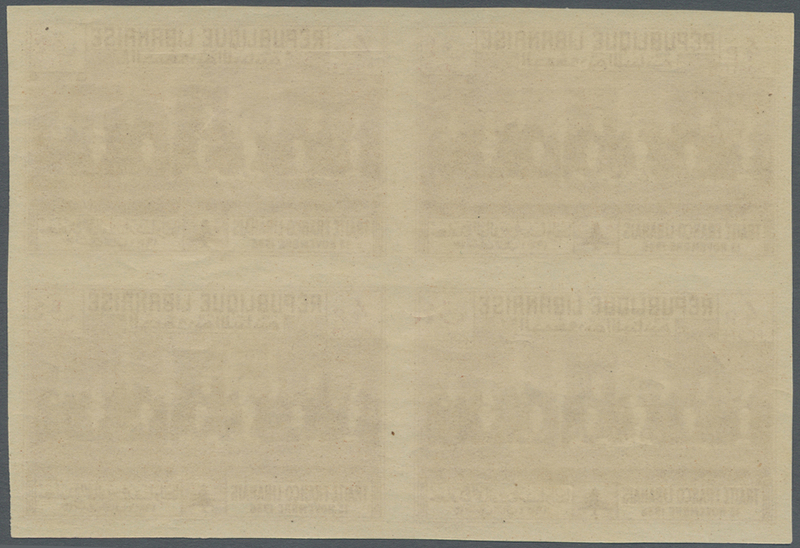 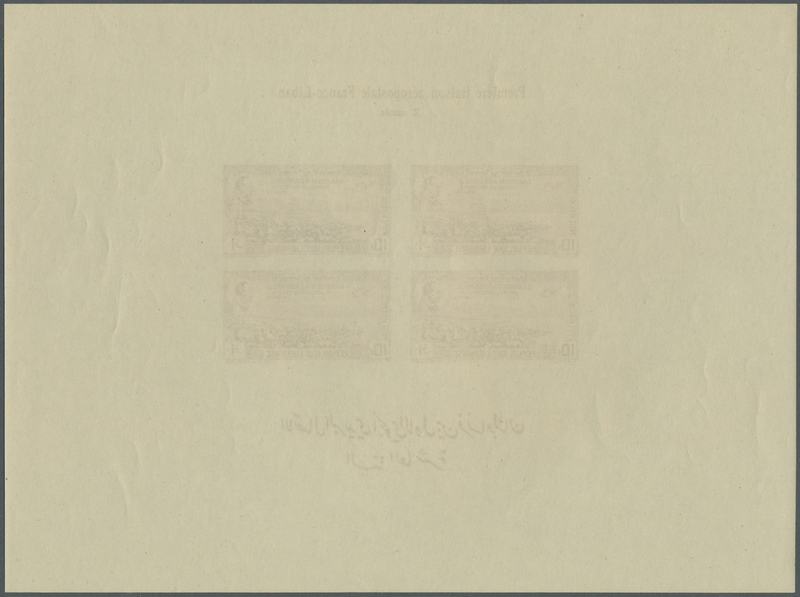 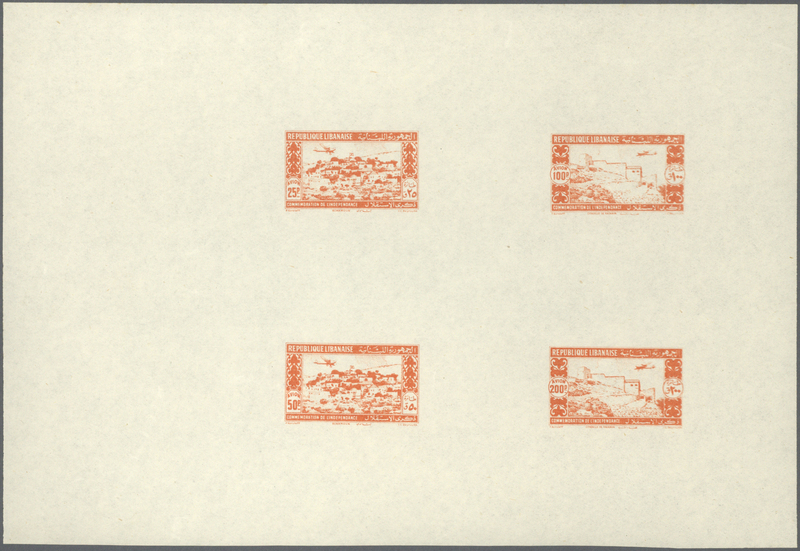 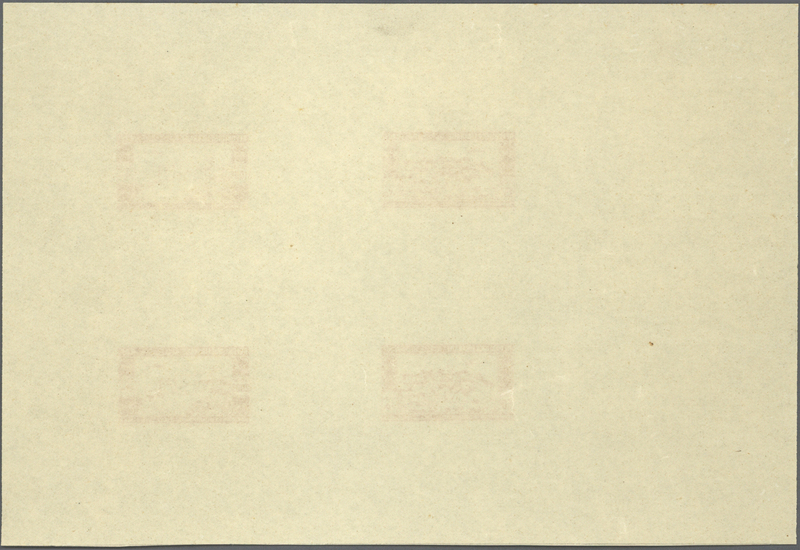 Only 120 sheets were issued imperforate. 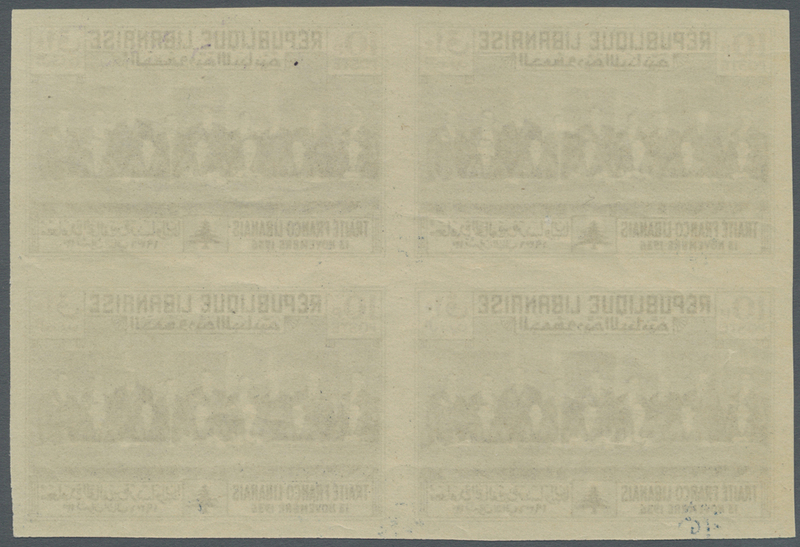 Maury BF1 nd, 2.750,- €. 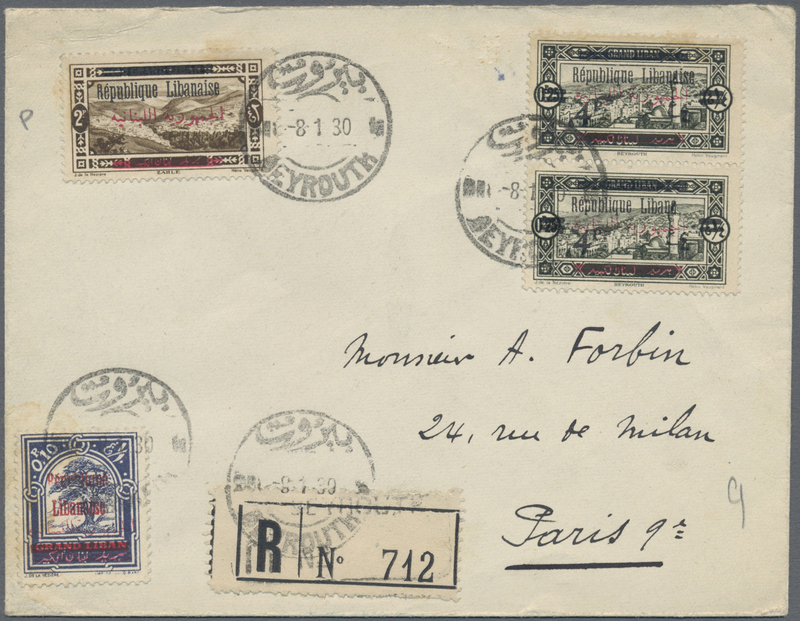 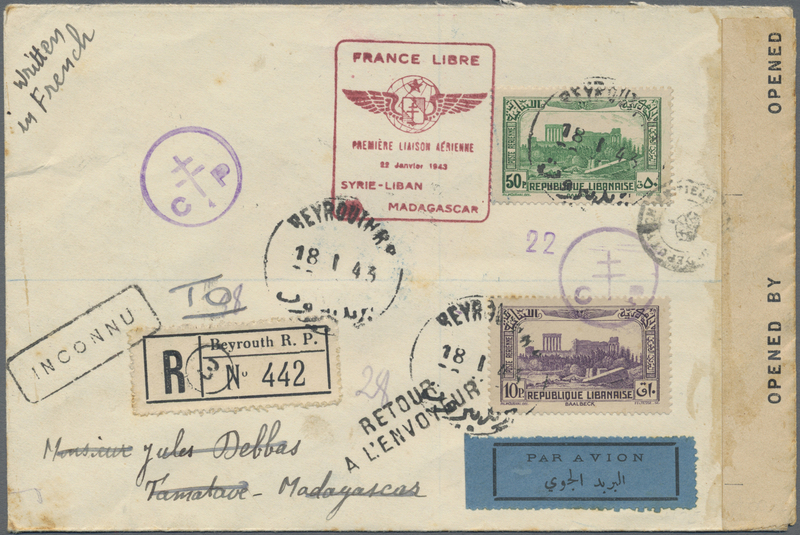 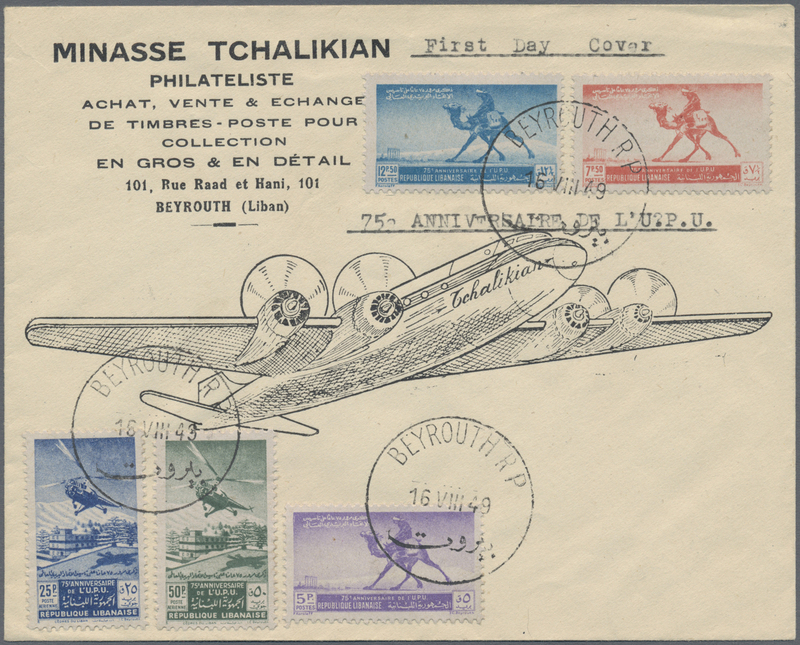 8952 postfrisch (never hinged) ** 242 C U (2) 1938, 10th Anniversary First Flight Marseille-Beirut, 10pi. 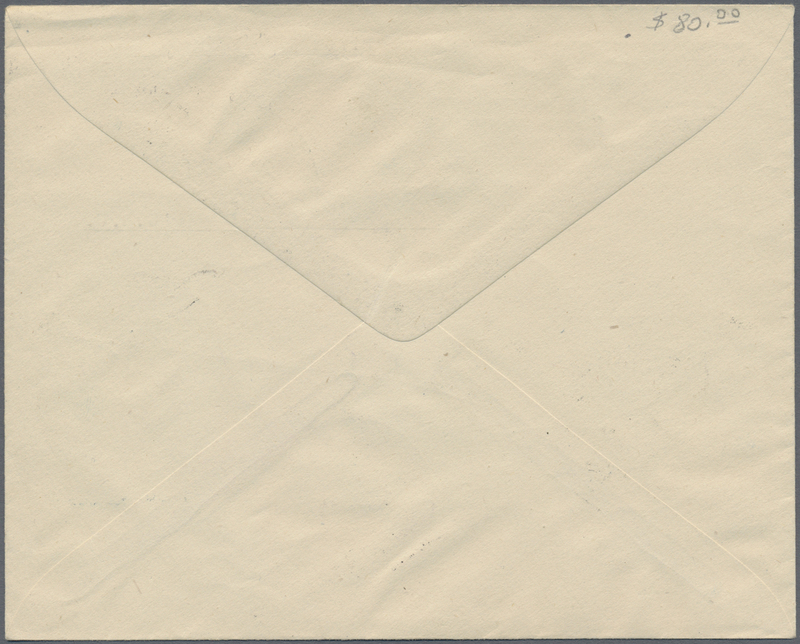 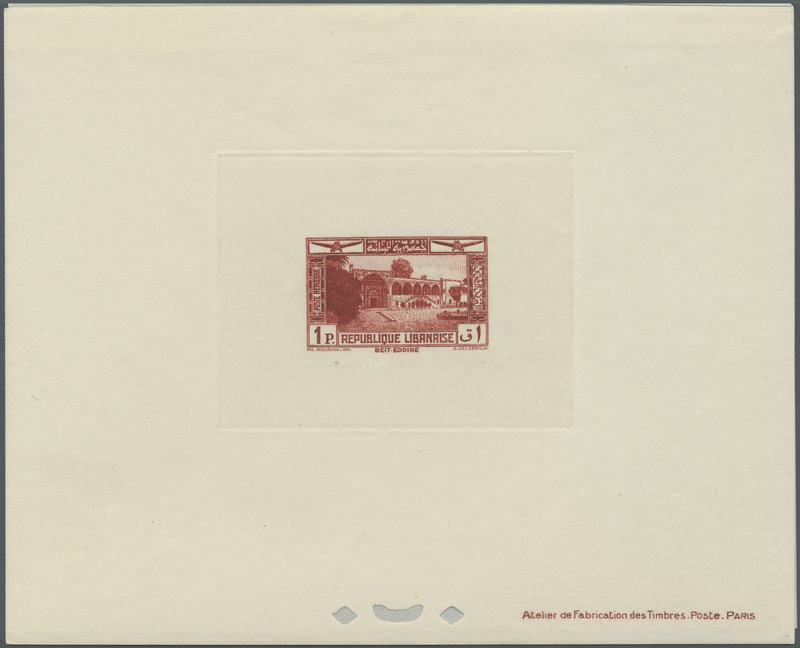 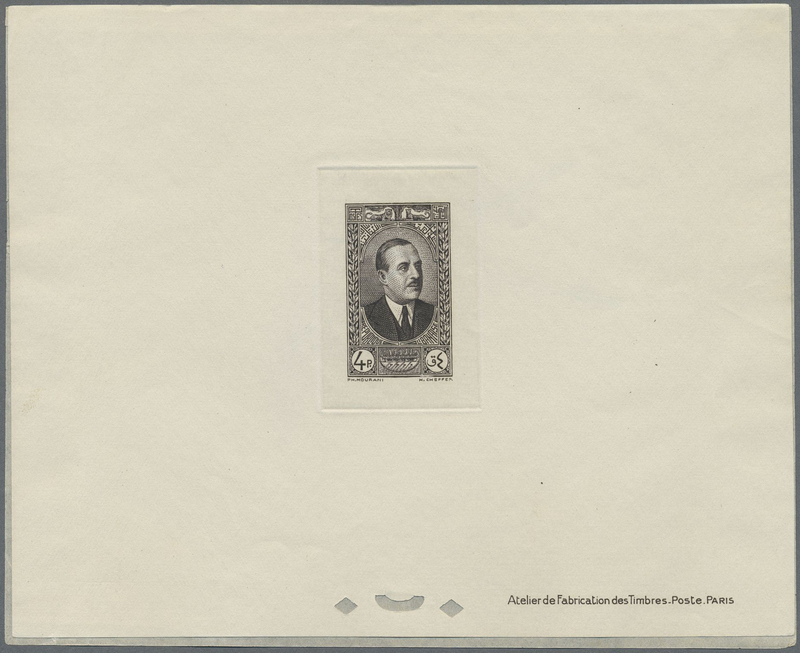 brownish lilac, IMPERFORATE bottom marginal vertical pair, unmounted mint. 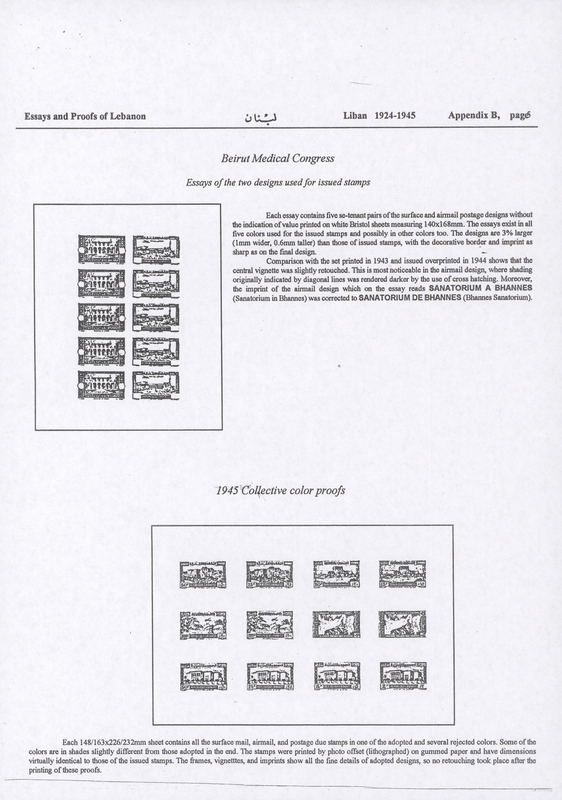 Only 300 imperforate stamps were issued. Maury PA71 nd, 880,- €. 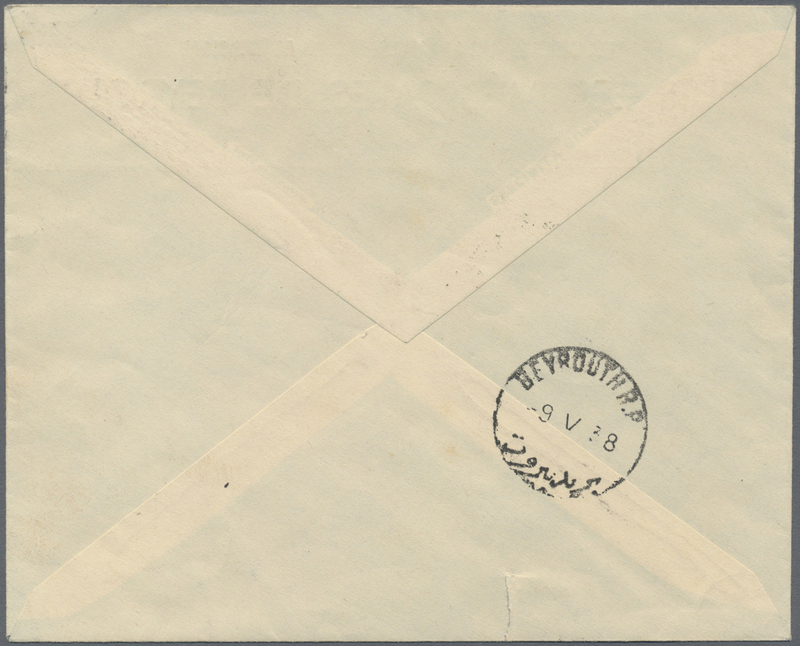 8954 postfrisch (never hinged) ** 252 DD (4) 1939, Definitives "BEIT-EDDINE", 7.50pi. 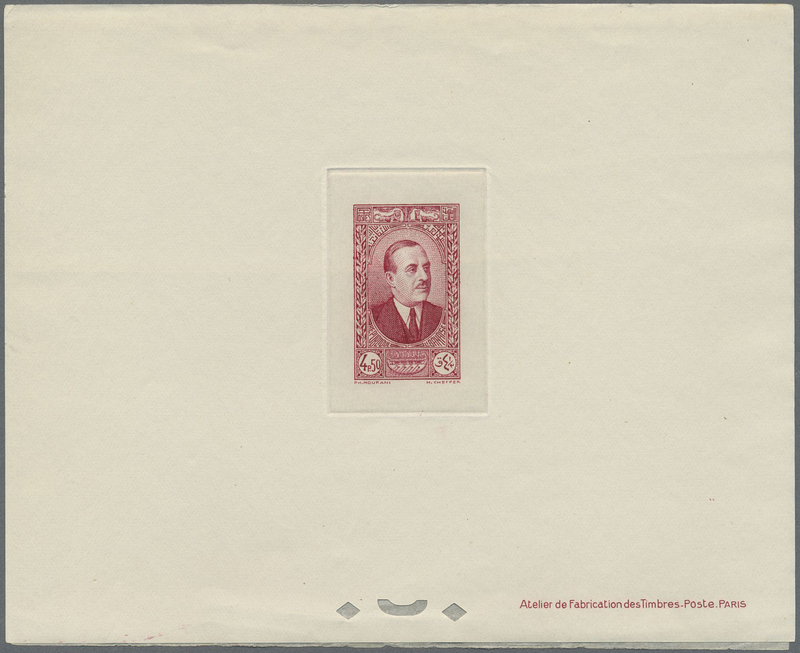 carmine with re-entry, most clearly seen in the bottom imprint at right, block of four with adjoining gutters, unmounted mint (one stamp toning spot). 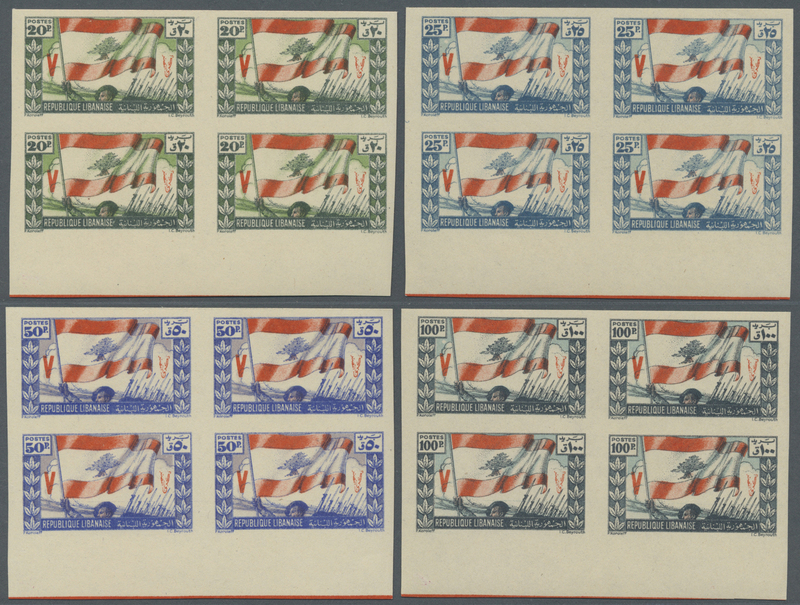 Maury 166, the variety not listed. 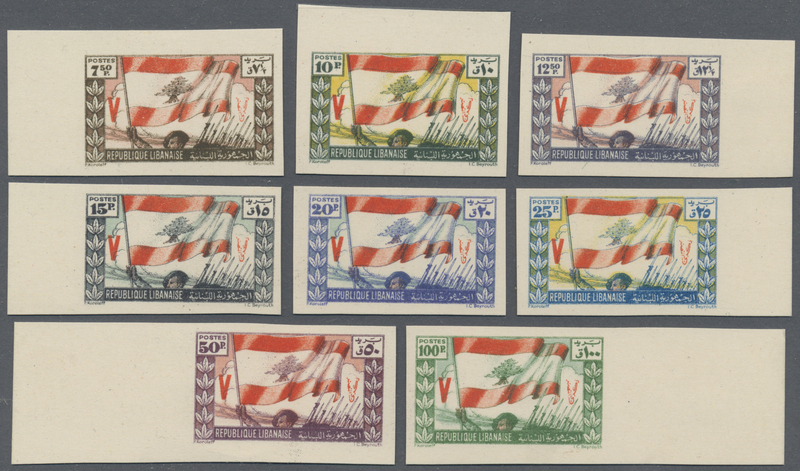 8955 postfrisch (never hinged) ** 254-59 U 1942 'Independence' complete set of six incl. 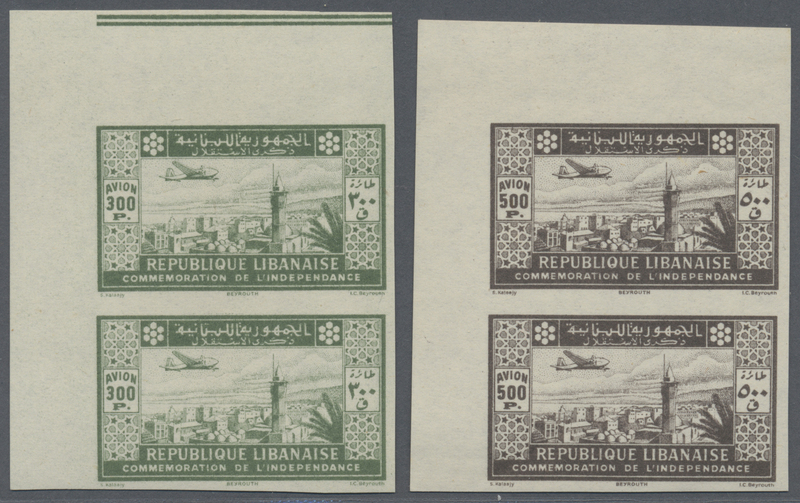 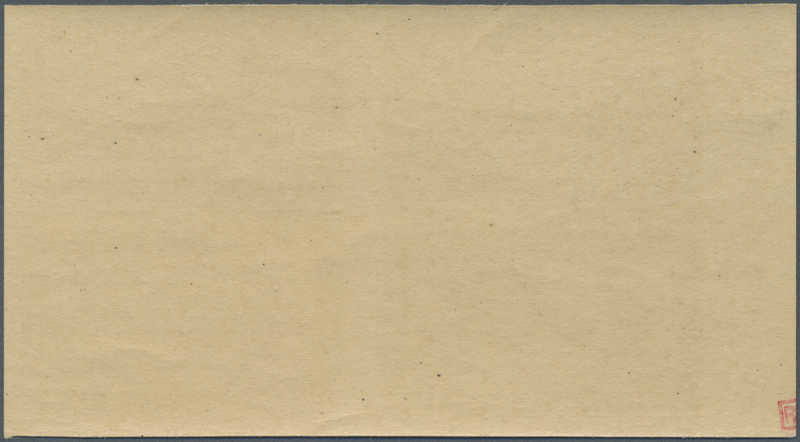 Air (top marginal), IMPERFORATED, mint never hinged, fresh, fine and scarce. 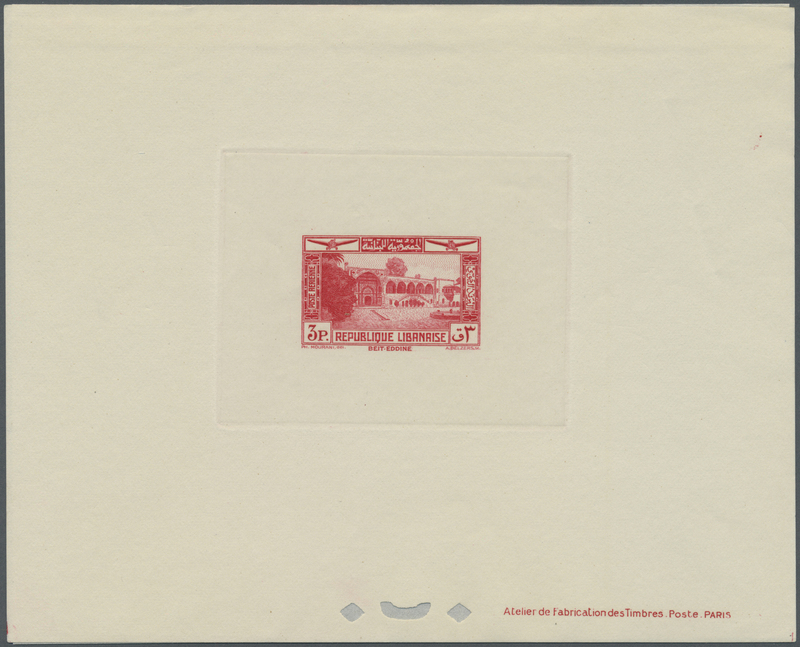 8958 postfrisch (never hinged) ** 267/76 U (4) 1943, 2nd Anniversary of Independence, 25pi. 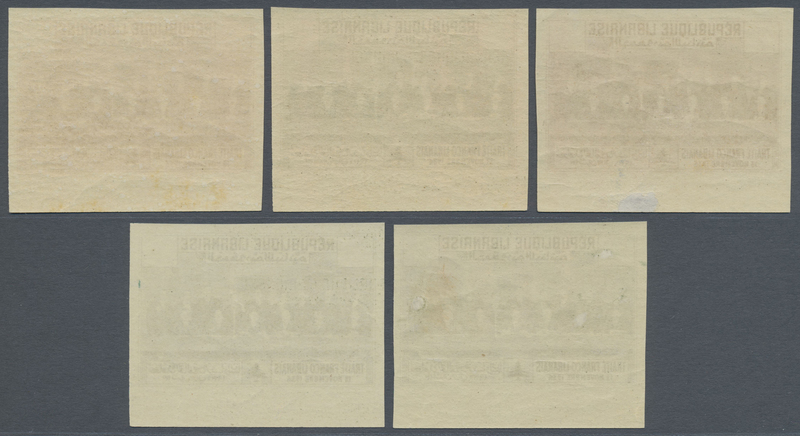 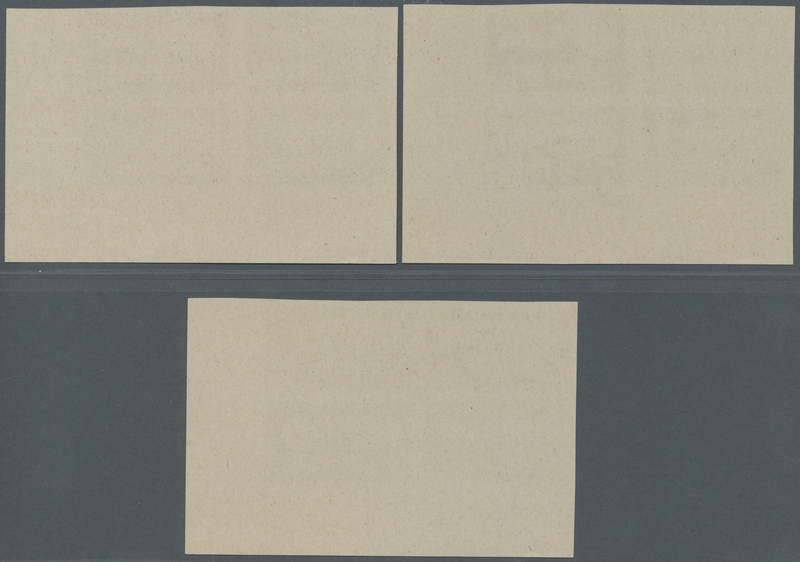 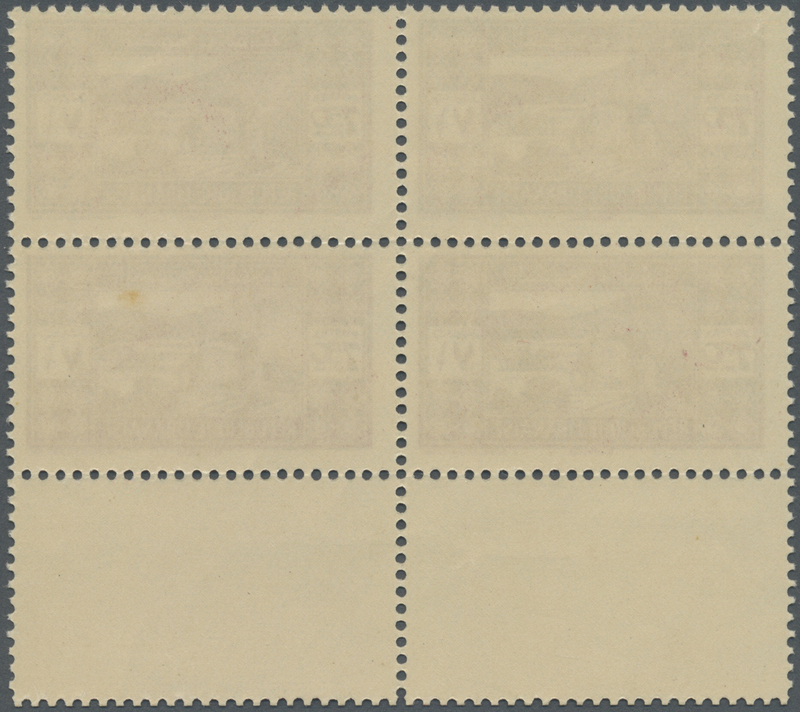 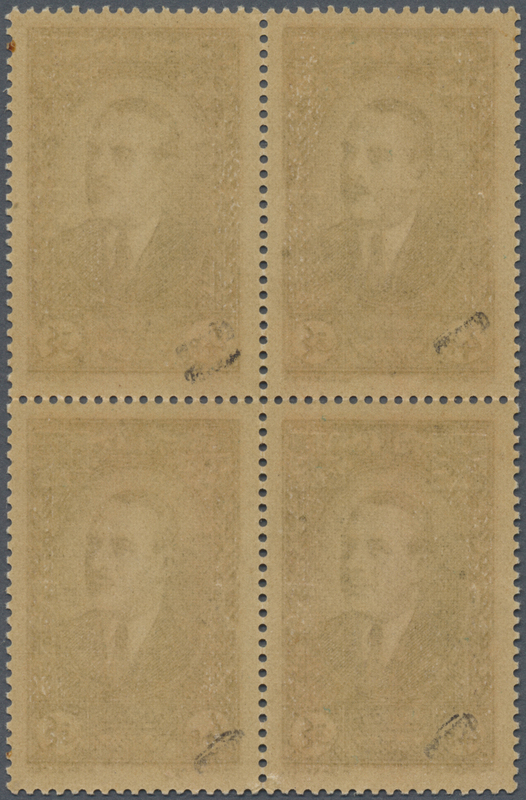 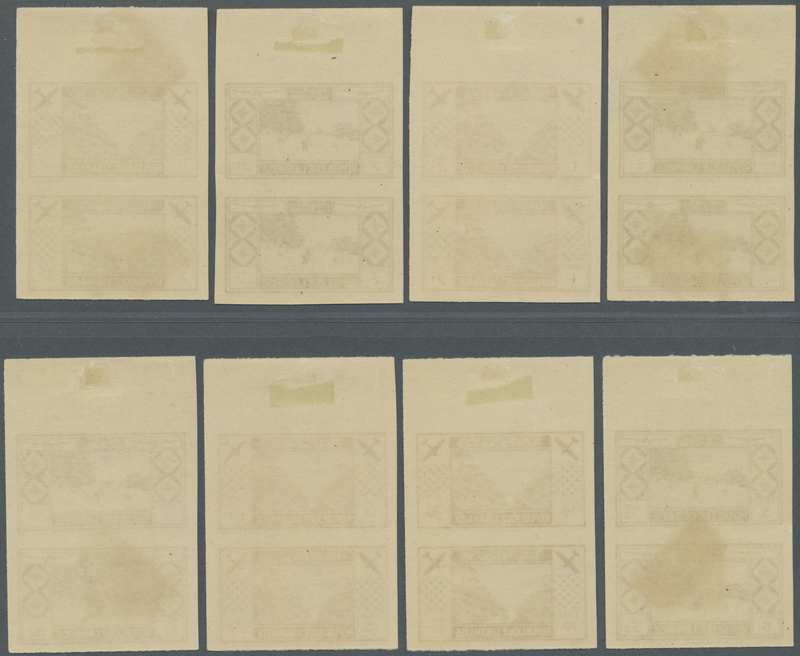 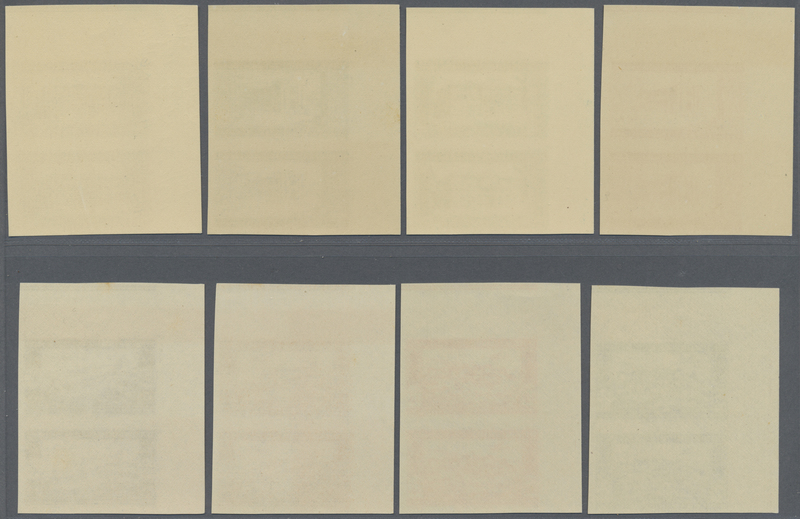 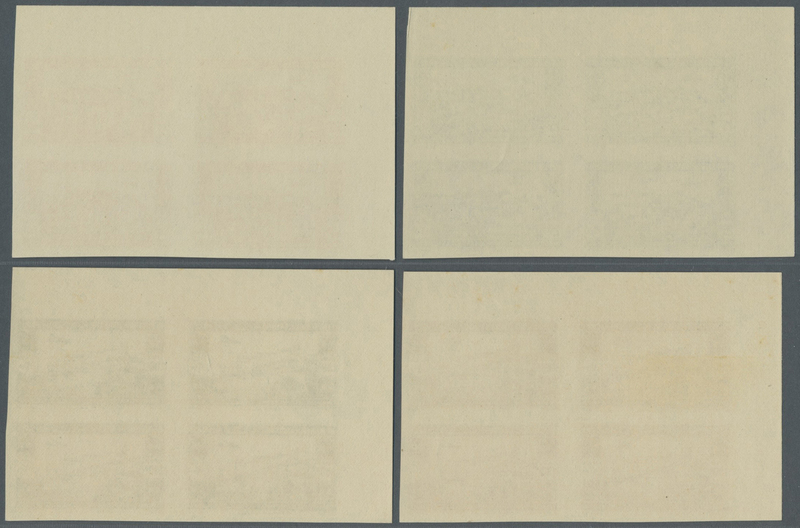 to 500pi., complete set of ten values as IMPERFORATE marginal blocks of four from the upper left corner of the sheet, unmounted mint (100pi. 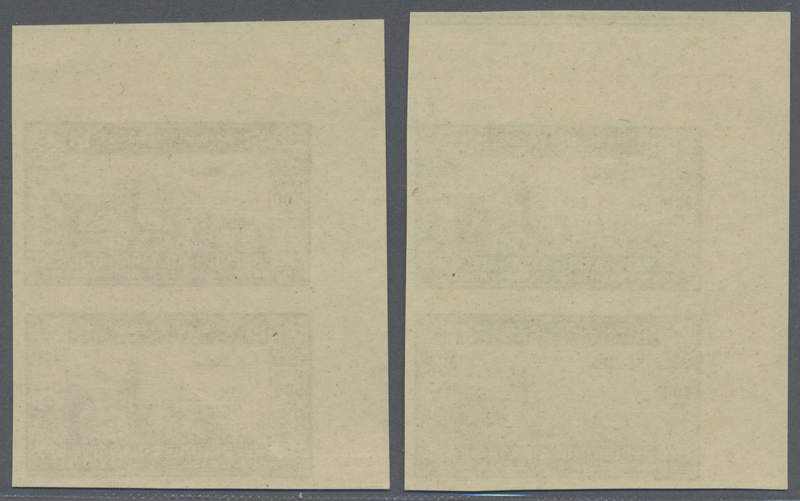 slight toning). 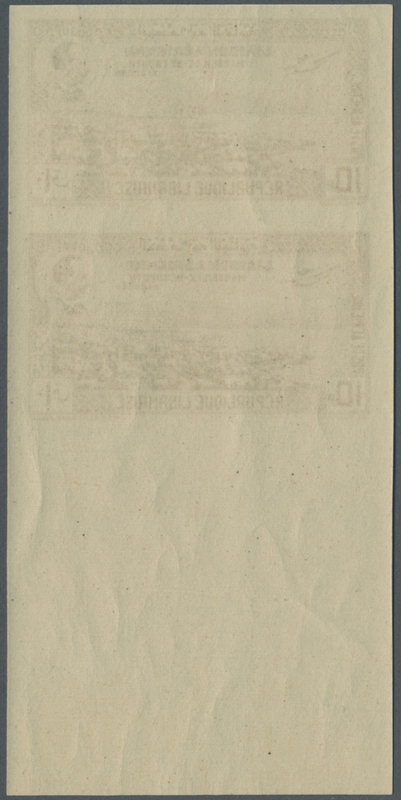 Maury 183/86 nd, PA82/87 nd, 3.060,- €. 8966 postfrisch (never hinged) ** 277/81 U/var. 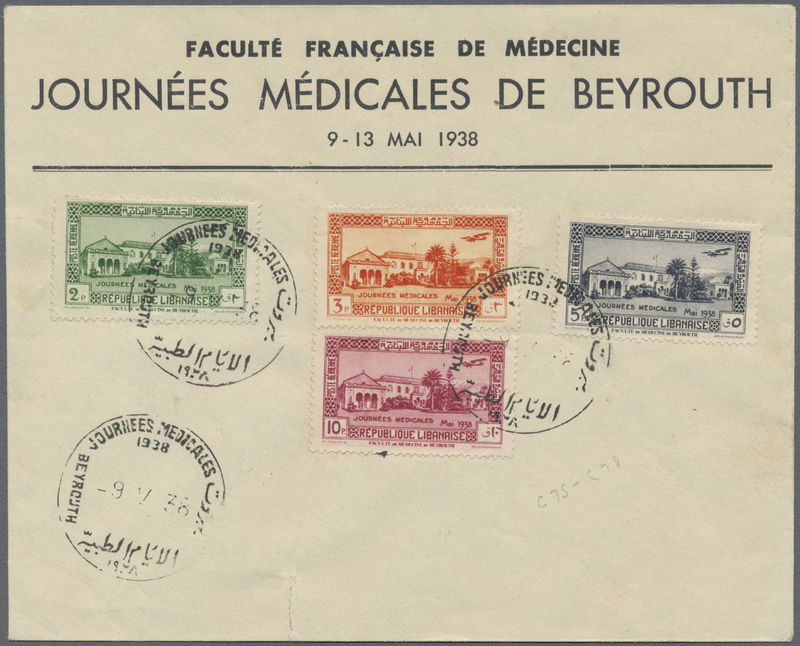 (4) 1943, Medical Congress, 10pi. 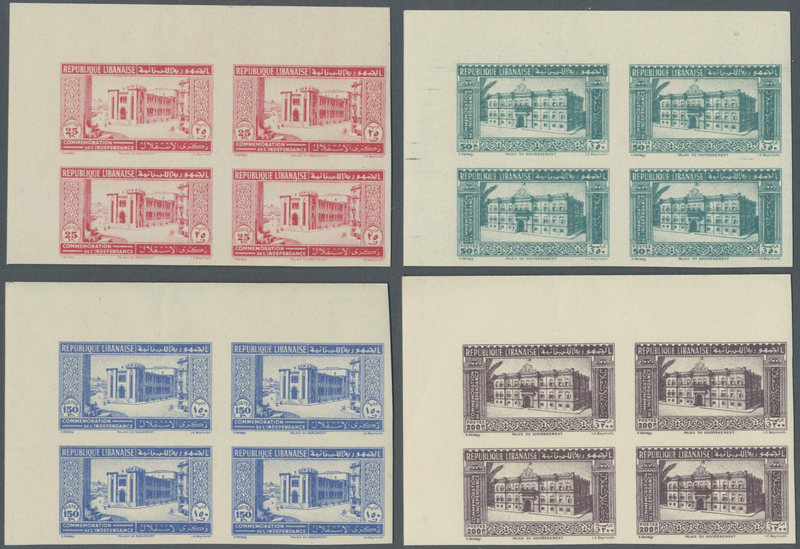 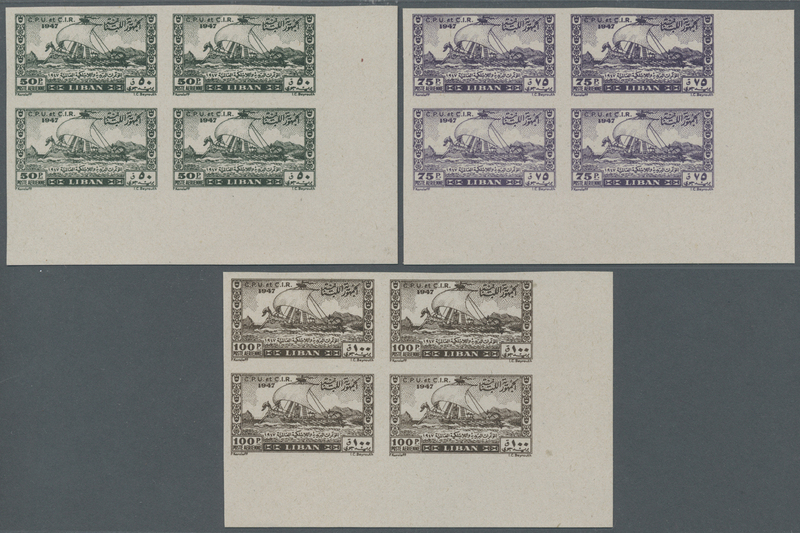 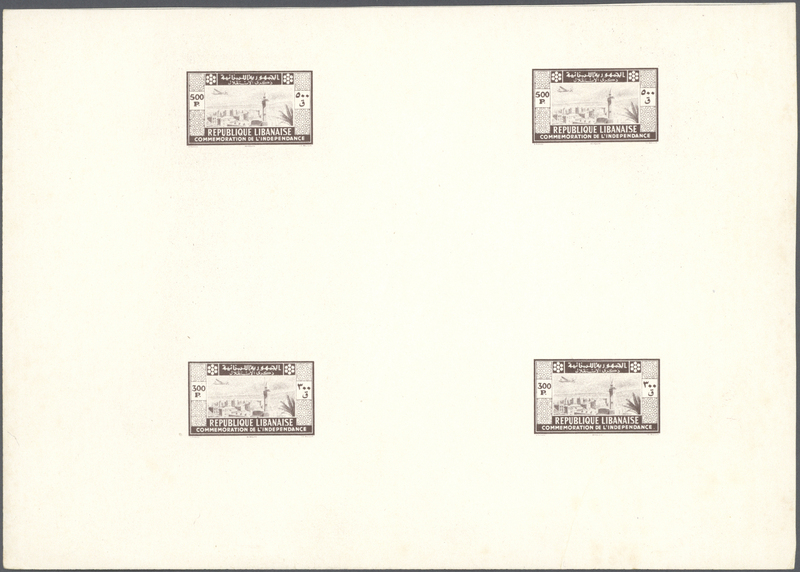 to 100pi., complete set of five values WITHOUT OVERPRINT as IMPERFORATE marginal blocks of four, unmounted mint. 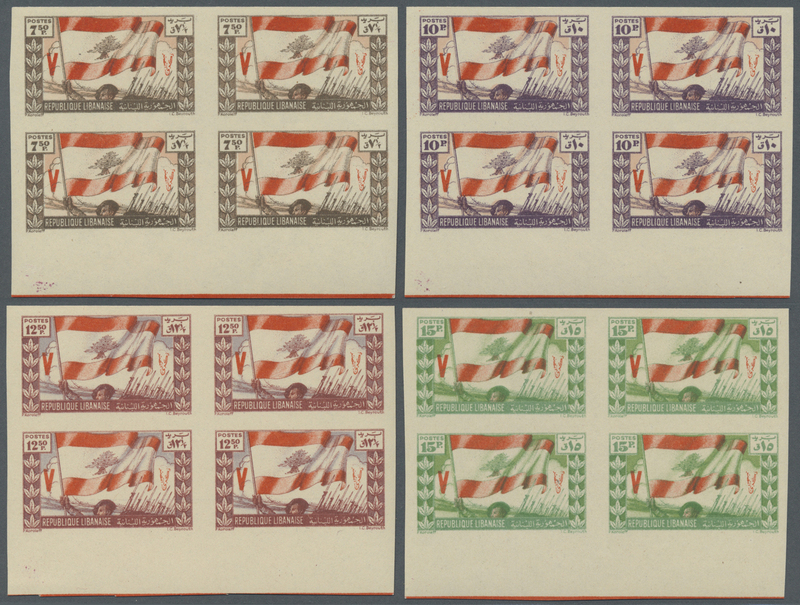 Maury 187/88a/nd, PA88/90a/nd, 17.060,- €. 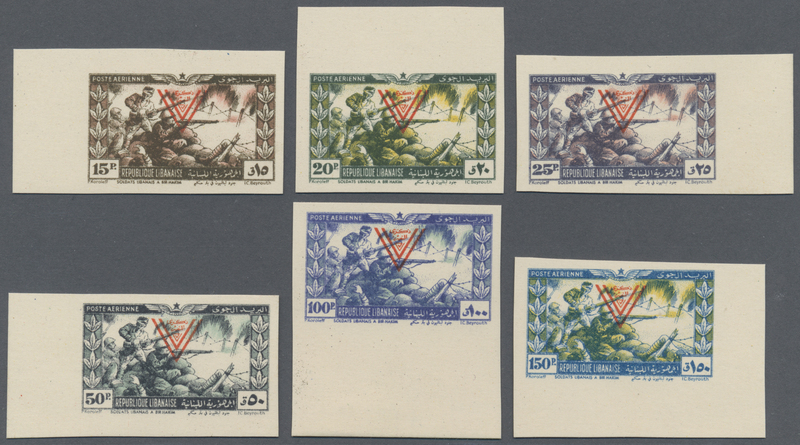 8972 postfrisch (never hinged) ** 300/07 U (4) 1946, 1st Anniversary of WWII Victory, 7.50pi. 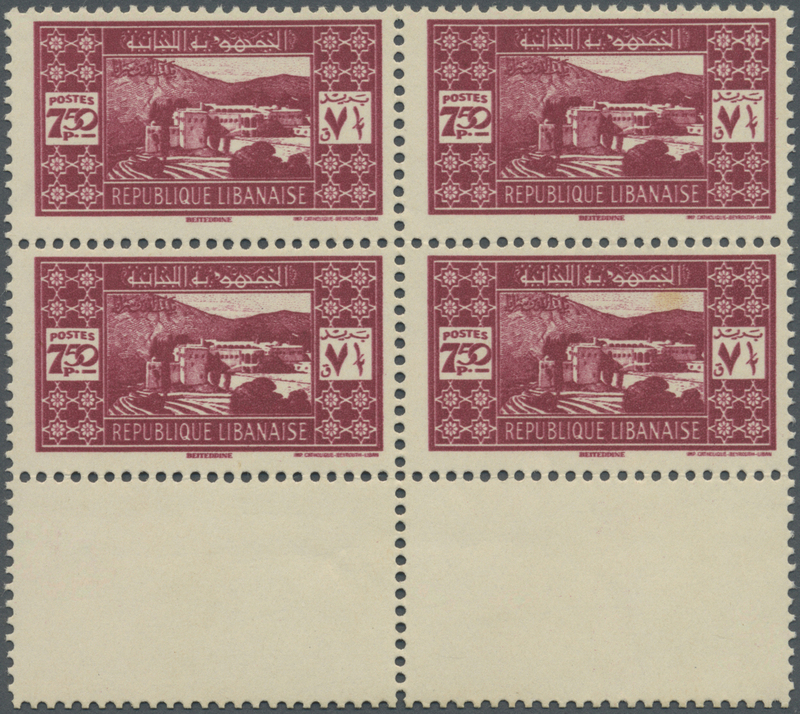 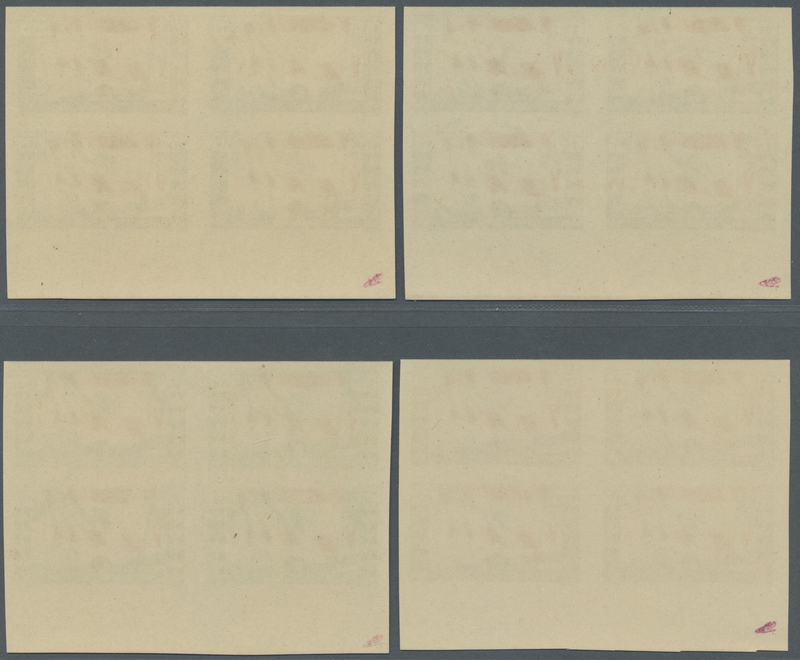 to 100pi., set of eight values each as IMPERFORATE bottom marginal blocks of four, unmounted mint. 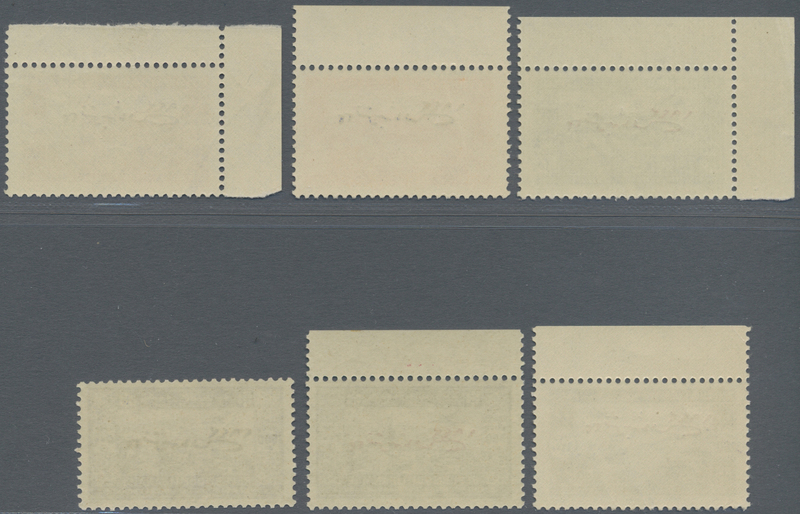 8976 postfrisch (never hinged) ** 371/76 U (4) 1947, 12th U.P.U. 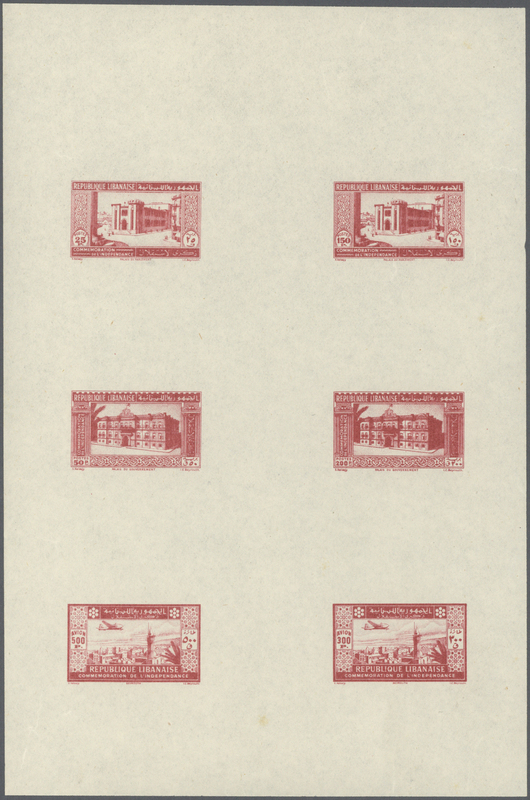 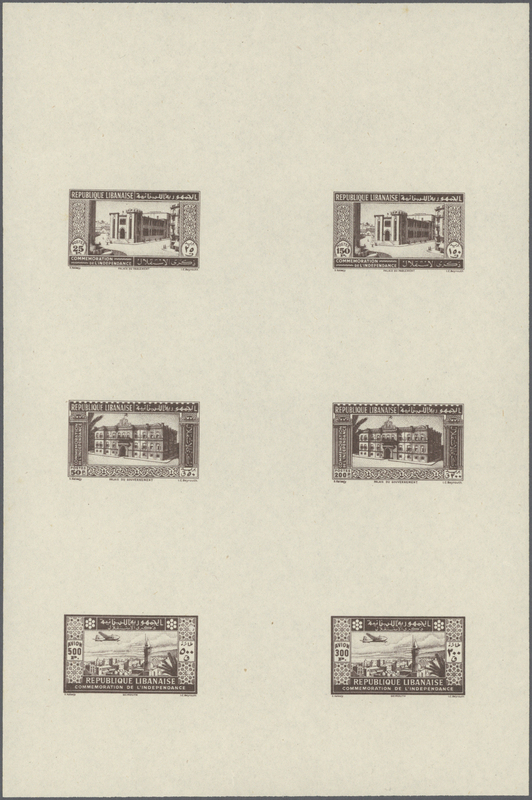 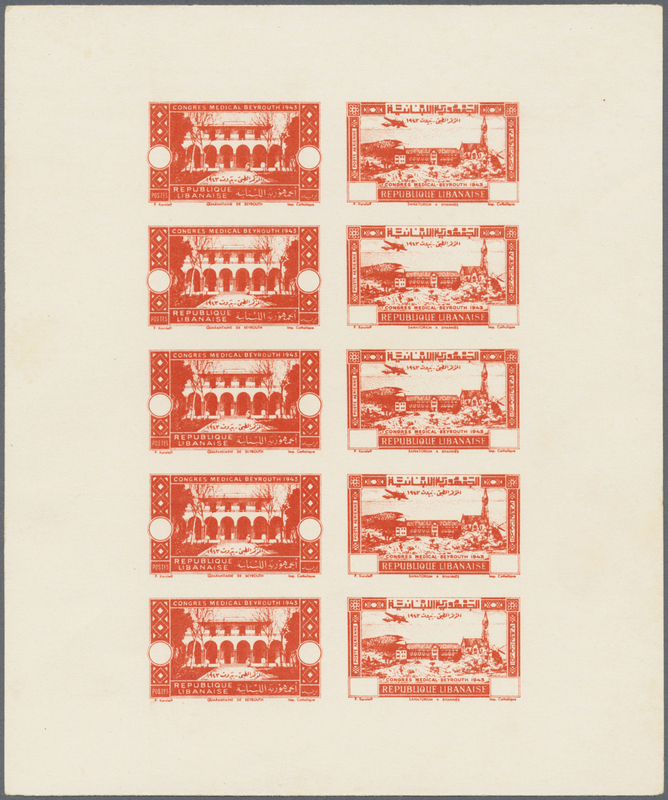 Congress, complete set of six values as IMPERFORATE blocks of four from the lower corner of the sheet, unmounted mint.